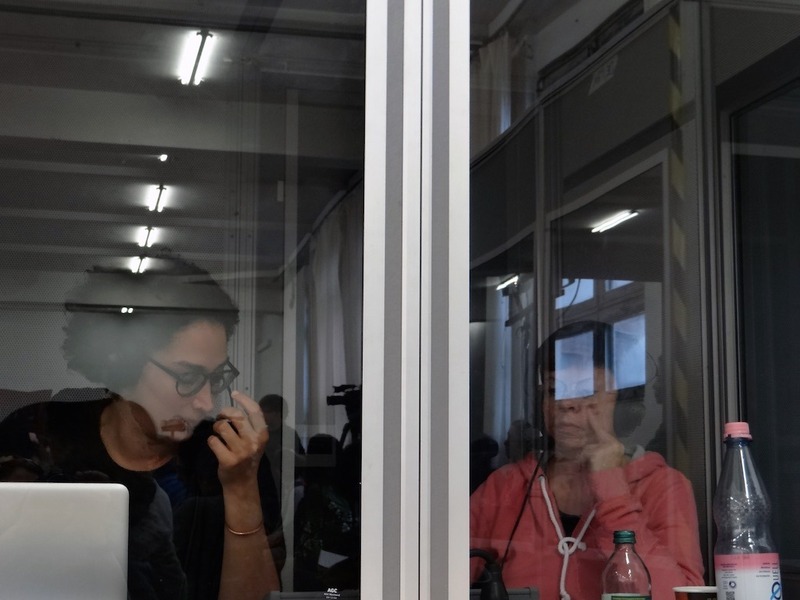 What does the expression "German with a migration background" even mean? 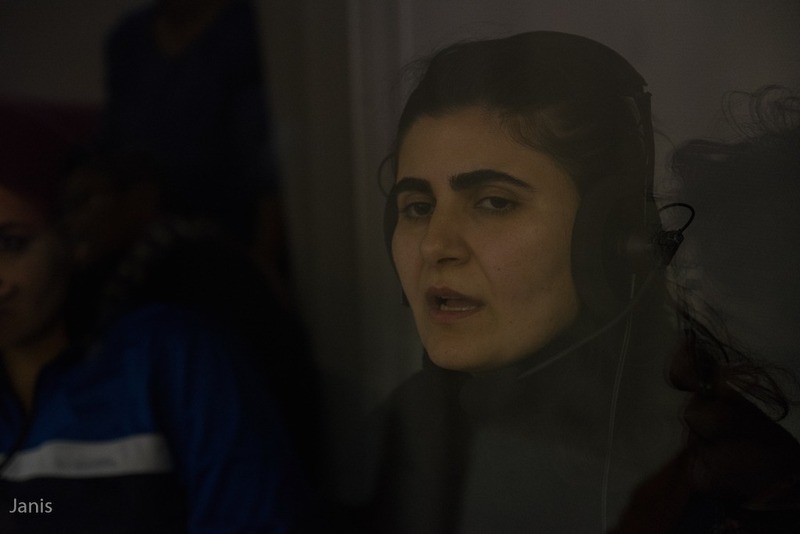 Why are these people not just seen and accepted as Germans? 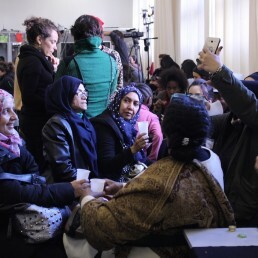 Two women with a so called "migration background" will talk about this racist term imposed by others to differentiate and divide them from the other "real" white Germans and how this type of discrimination has affected their identity as Germans. 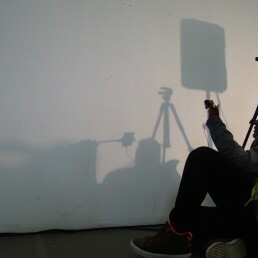 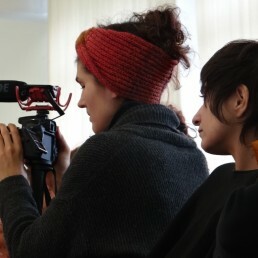 The video can be downloaded on Vimeo. 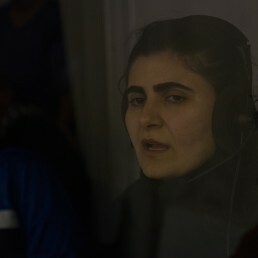 See license below. 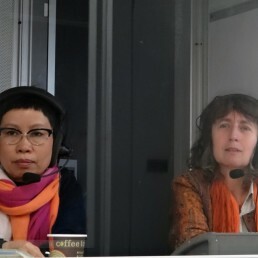 The audio files can be downloaded on archive.org. 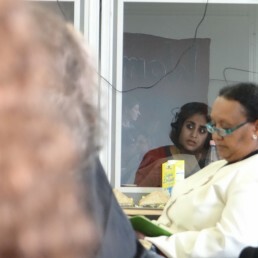 See license below. 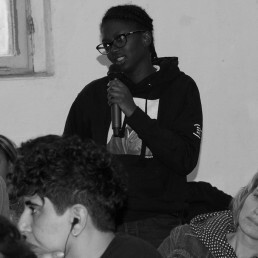 Lahya (Stefanie-Lahya Aukongo) ist eine Schwarze, intersektionelle Freiberuflerin. 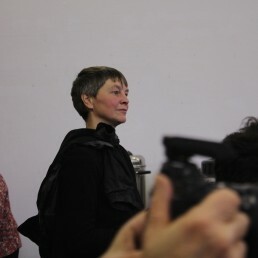 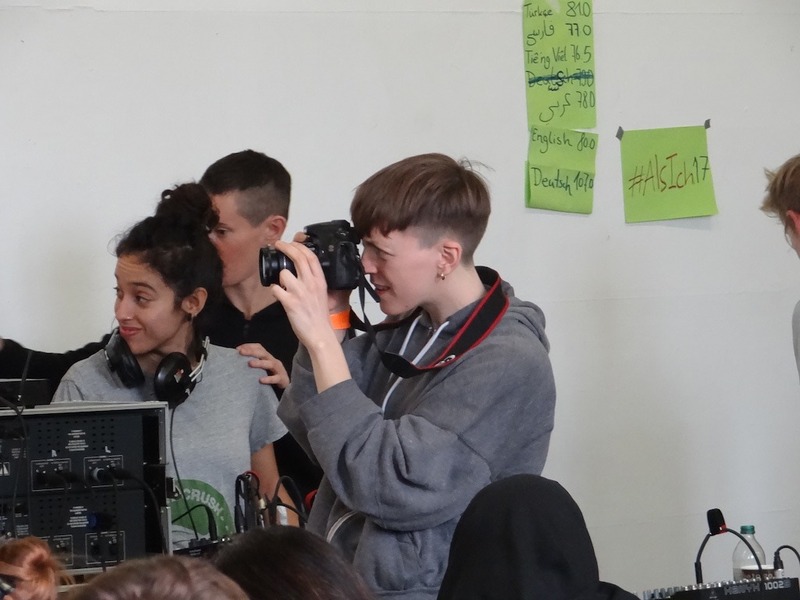 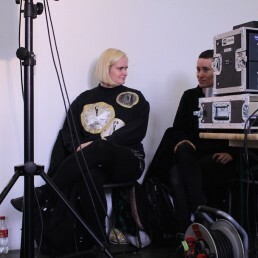 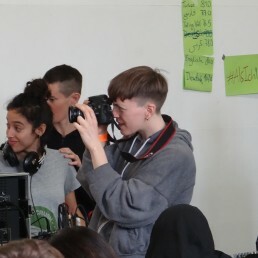 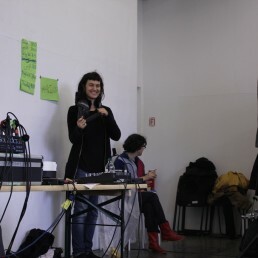 Sie ist Künstlerin, Autorin, Poetin, Kuratorin, Multiplikatorin, Fotografin, Aktivistin, Workshop-Teamerin und Sängerin. 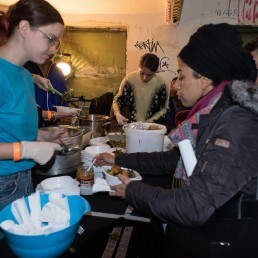 Zu viel für ein kurzes Leben? 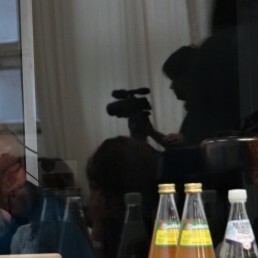 Ganz klar: Nein! 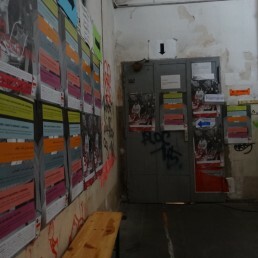 In Lahyas Leben dreht sich fast alles um liebevoll sowie gesellschaftskritisch angereihte Realitätsmoleküle, diese sind ummantelt mit Gesang, Fotografie und_oder Poesie. 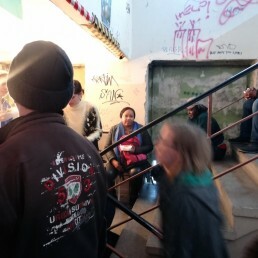 In ihr wohnt eine Schwarze, von gesellschaftlicher Behinderung betroffene, neurodiverse, von unerschöpflichen Emotionen getragene, queere, phat-is beautiful, mehrfachüberlebende Akademikerin, Künstlerin und Aktivistin mit deutschem Pass. 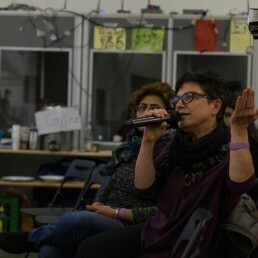 Eine königliche, ost, weiß, und weiblich sozialisierte, poly-li_ebende cis_Femme aus der Mittelschicht, mit aus_reichend finanziellen Mitteln, angemessen vielen Haaren auf dem Kopf und mit großem Herz. 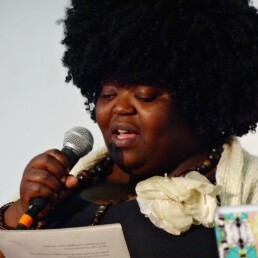 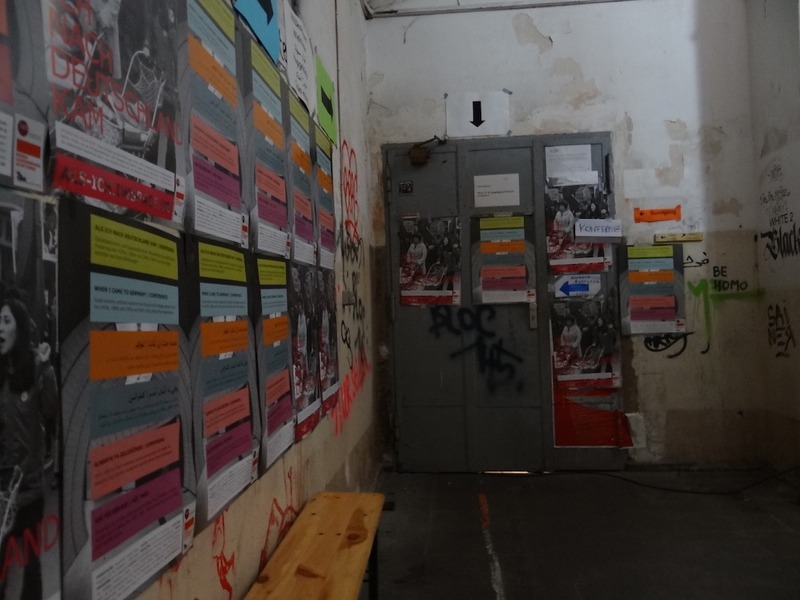 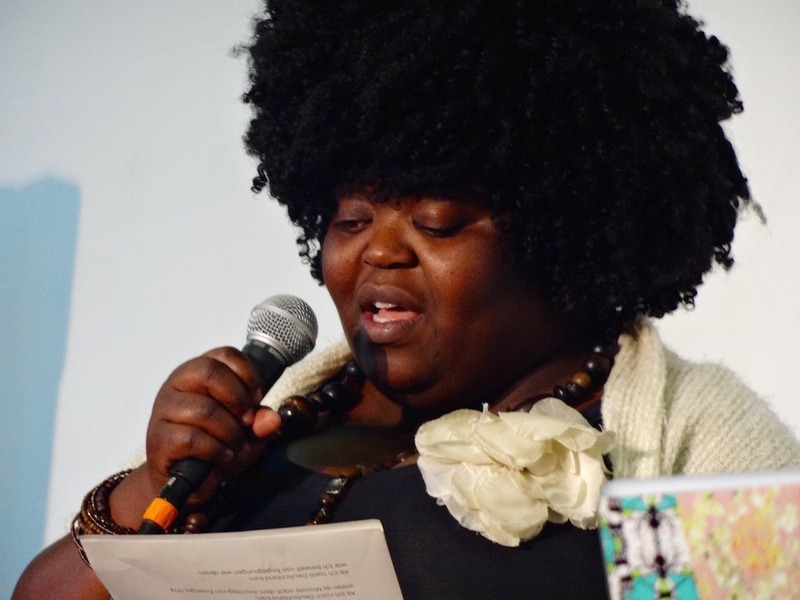 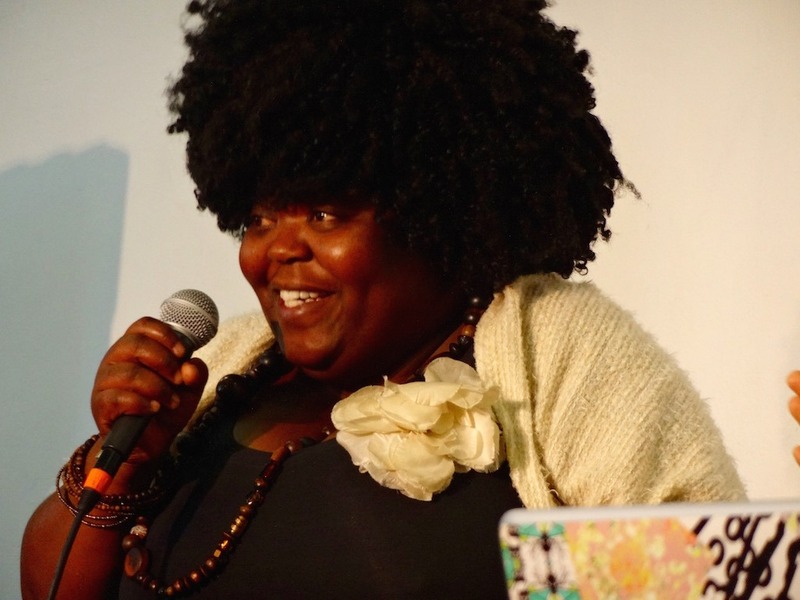 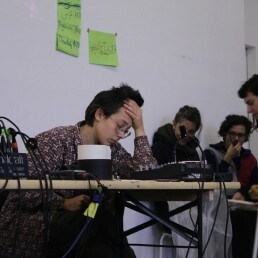 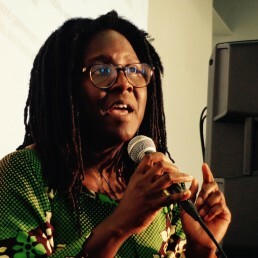 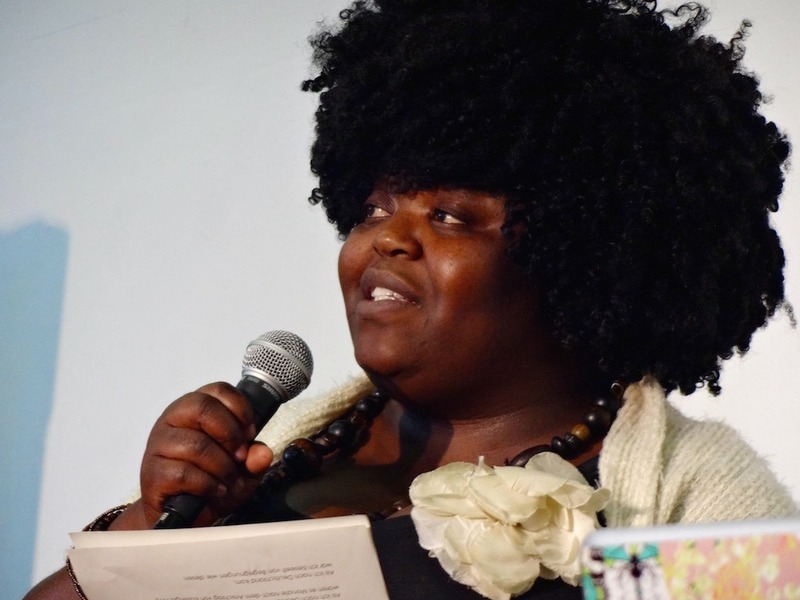 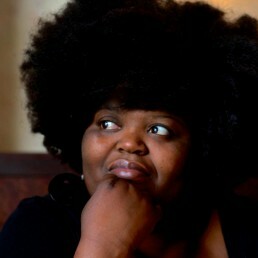 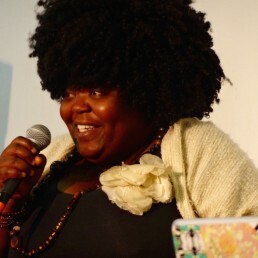 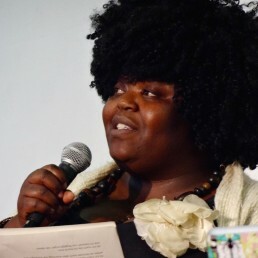 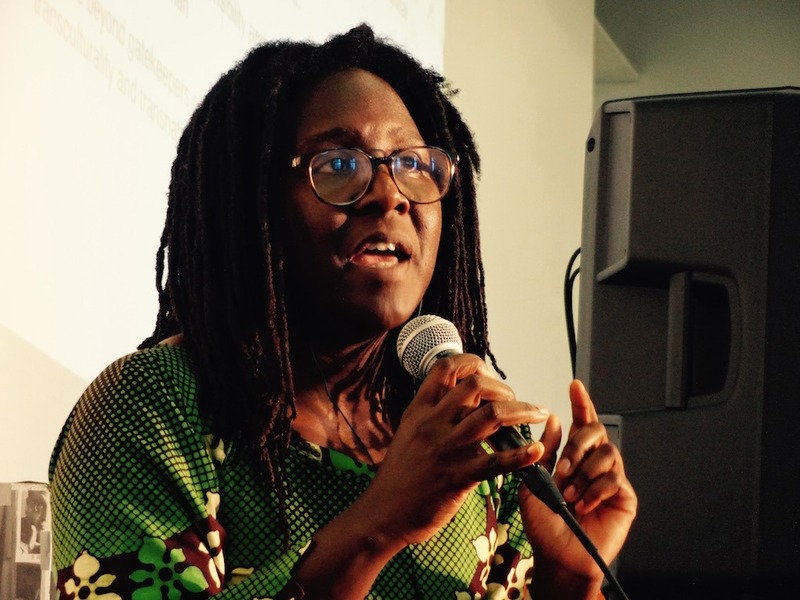 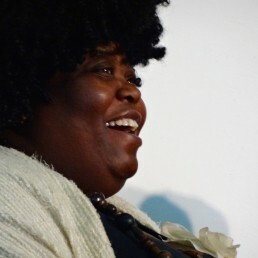 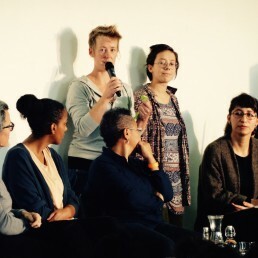 (Stand: September 2017)Sie lebt Buchstaben und beschäftigt sie sich mit Themen wie Dekolonialisierung, Traum(a), Selbst_Liebe, Intersektionalität, Heilung, Privilegien, Identität_en und ganz besonders warmes Erdbeereis. 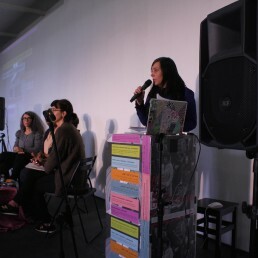 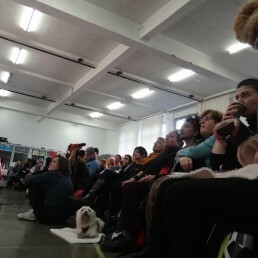 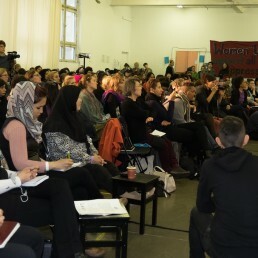 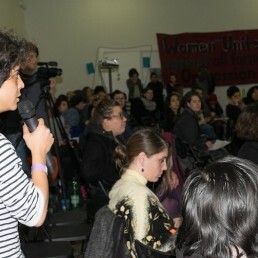 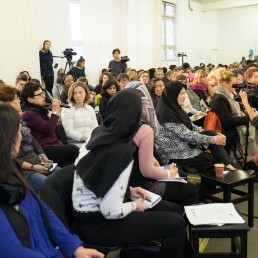 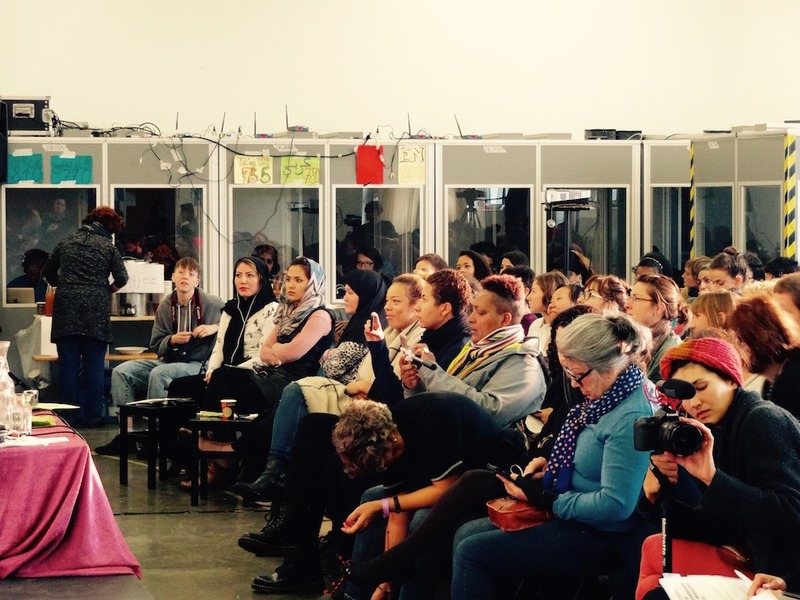 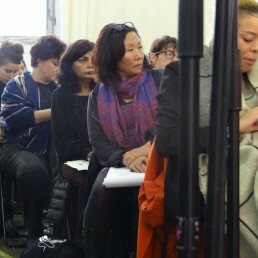 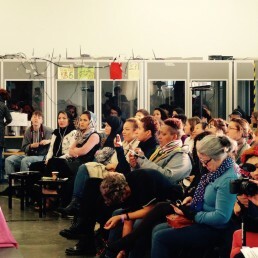 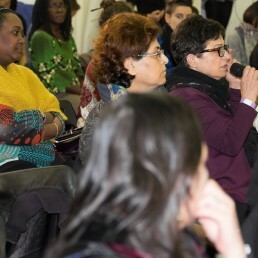 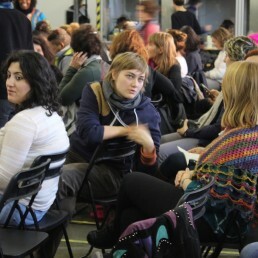 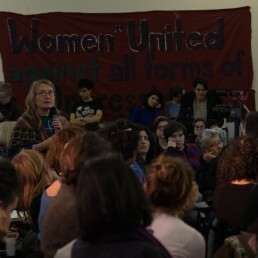 International Womenspace organised a two-day conference in Berlin in October 2017. 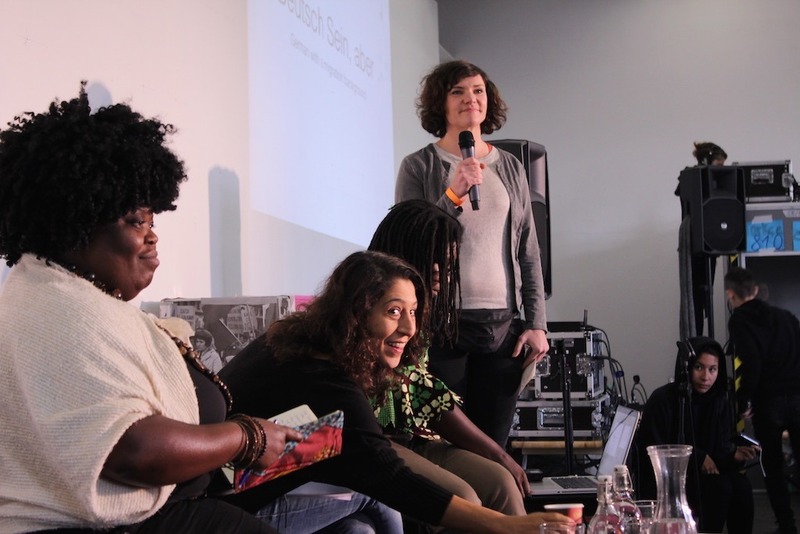 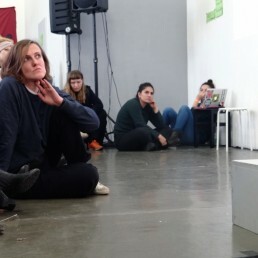 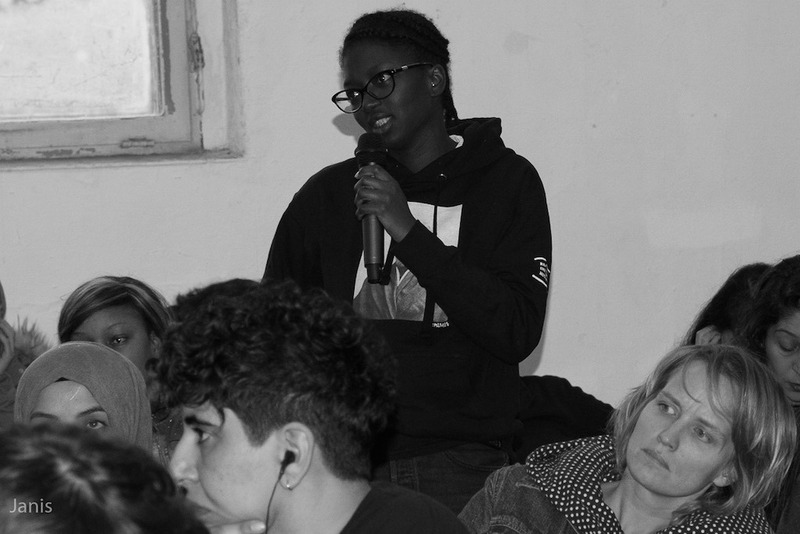 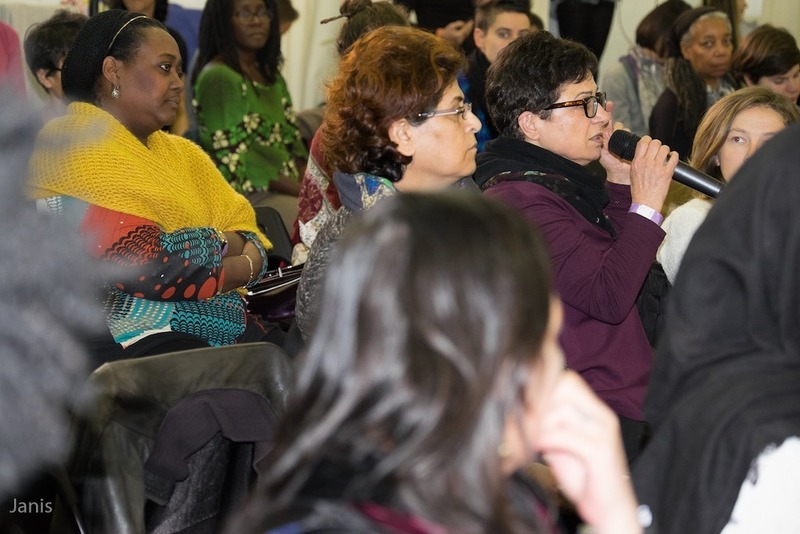 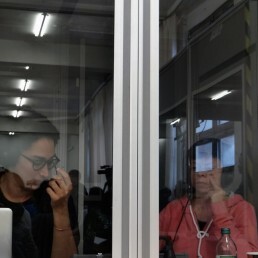 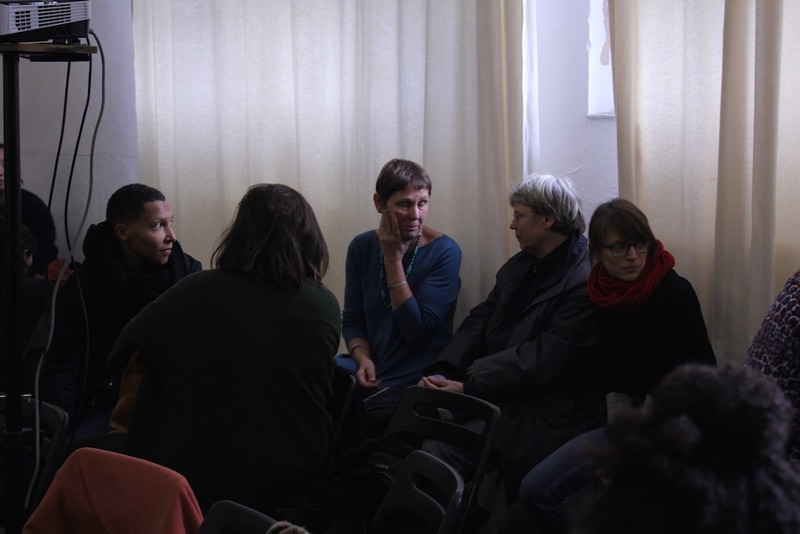 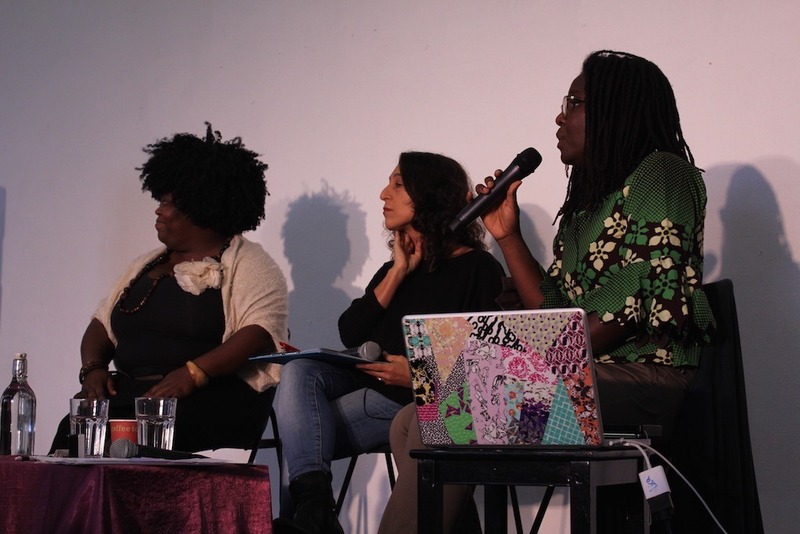 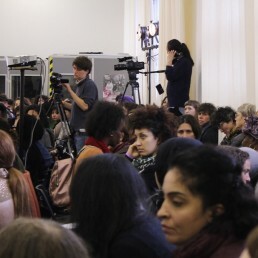 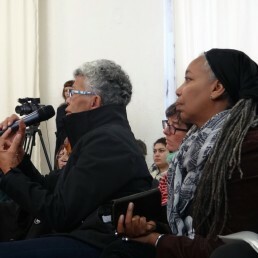 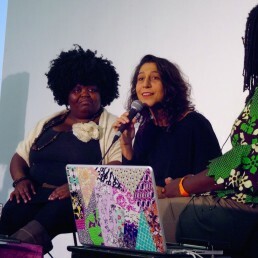 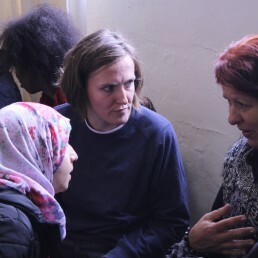 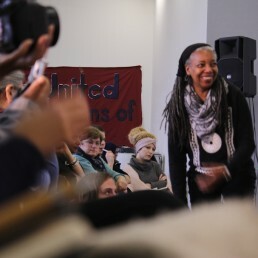 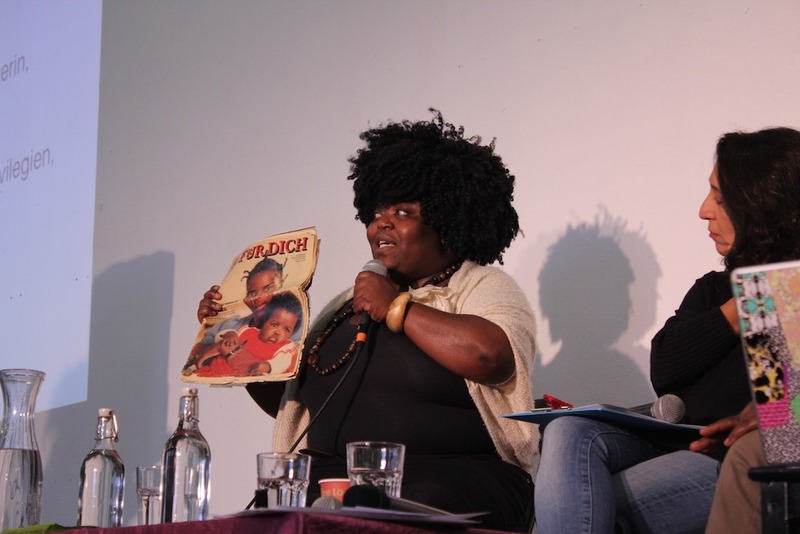 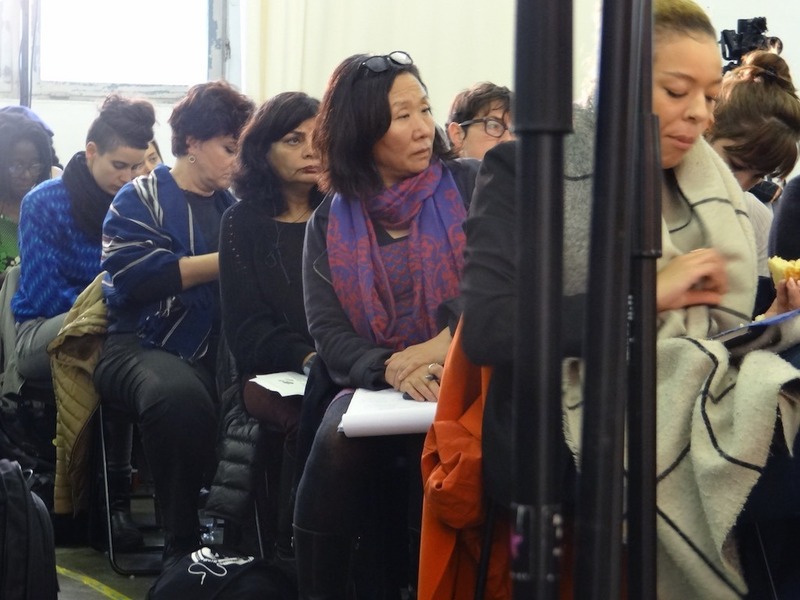 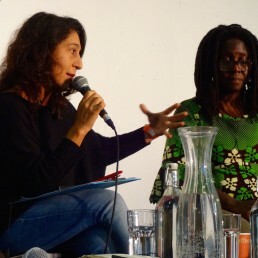 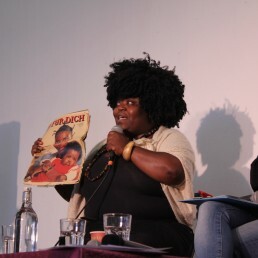 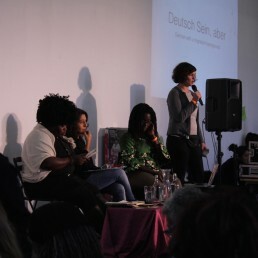 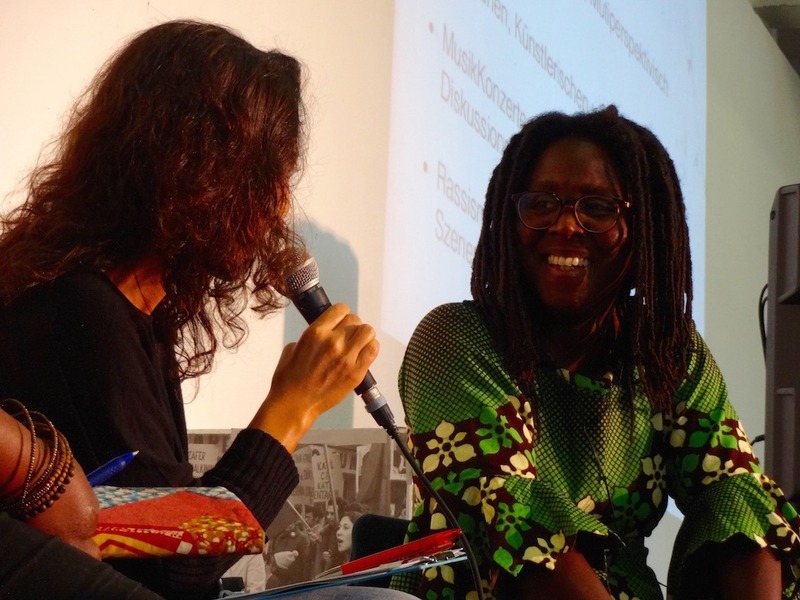 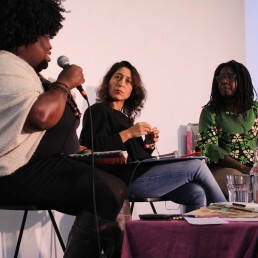 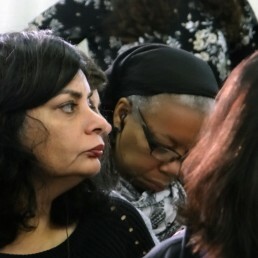 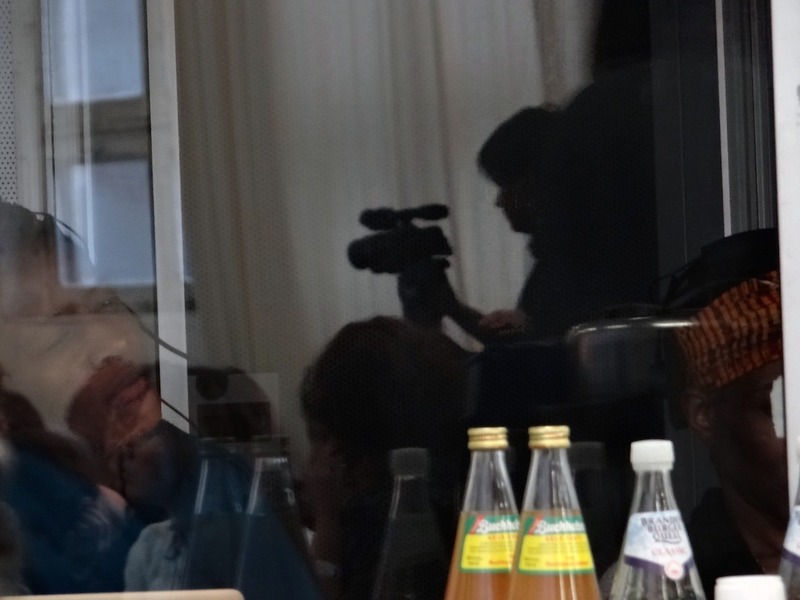 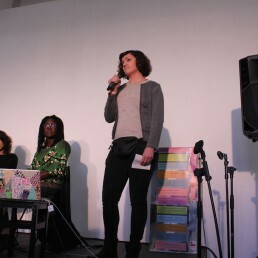 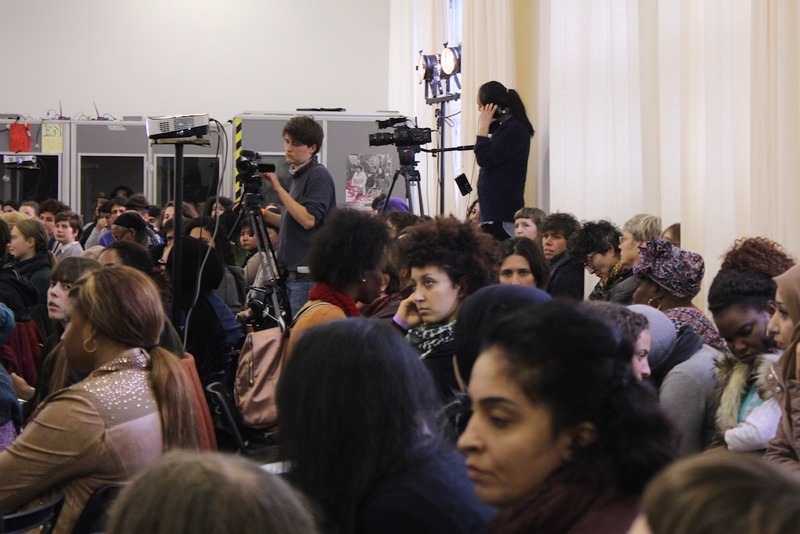 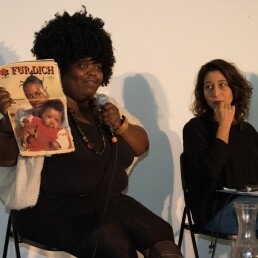 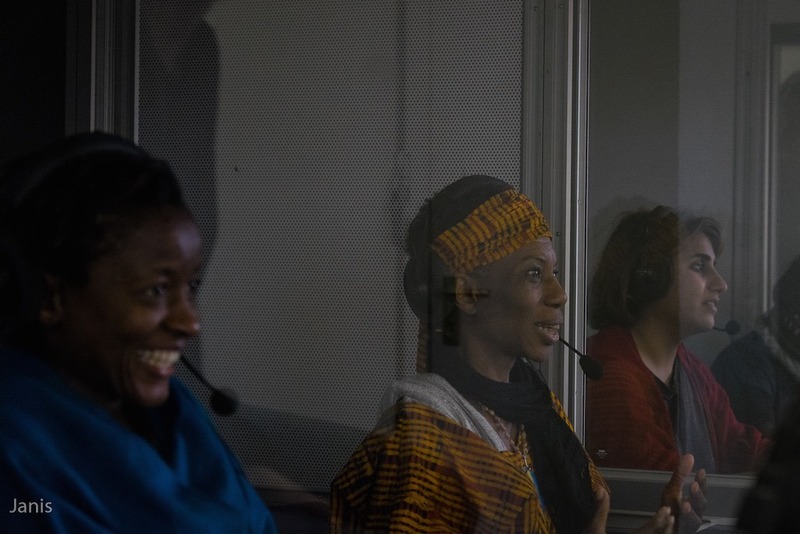 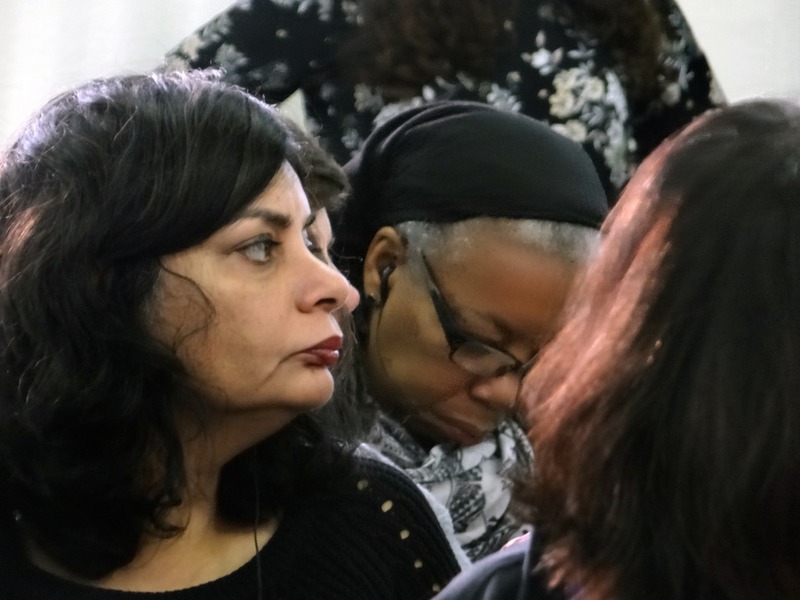 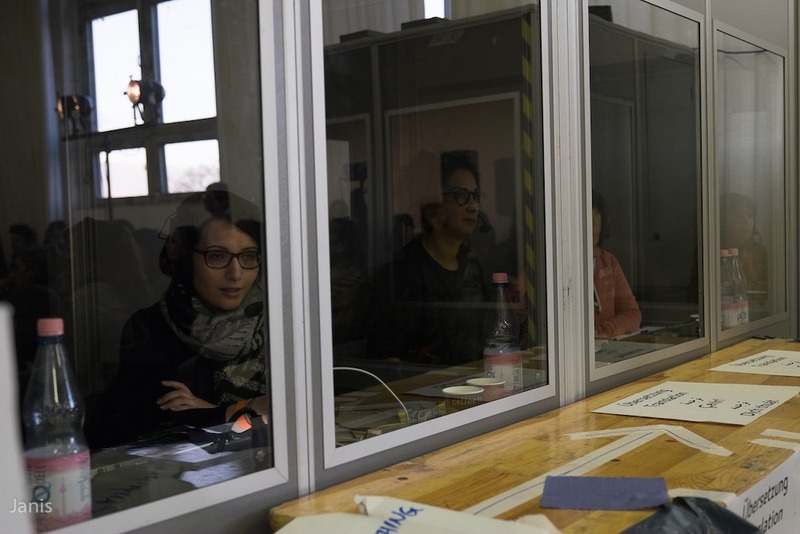 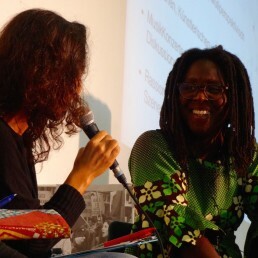 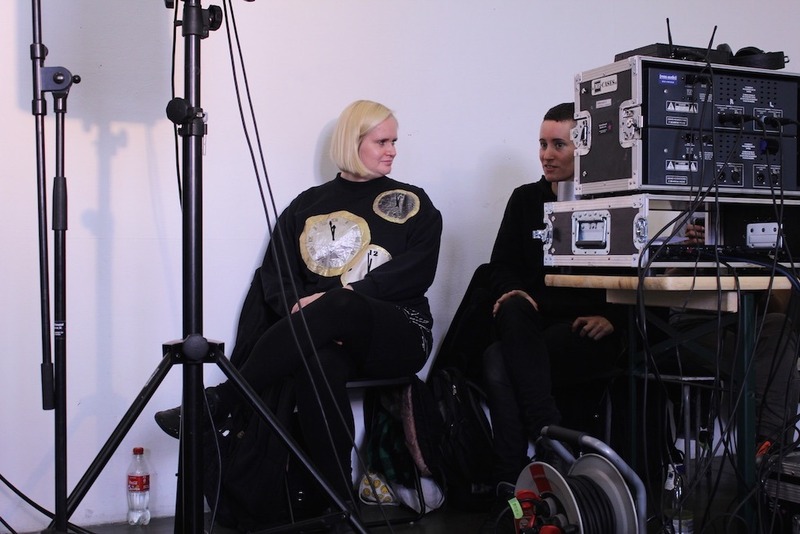 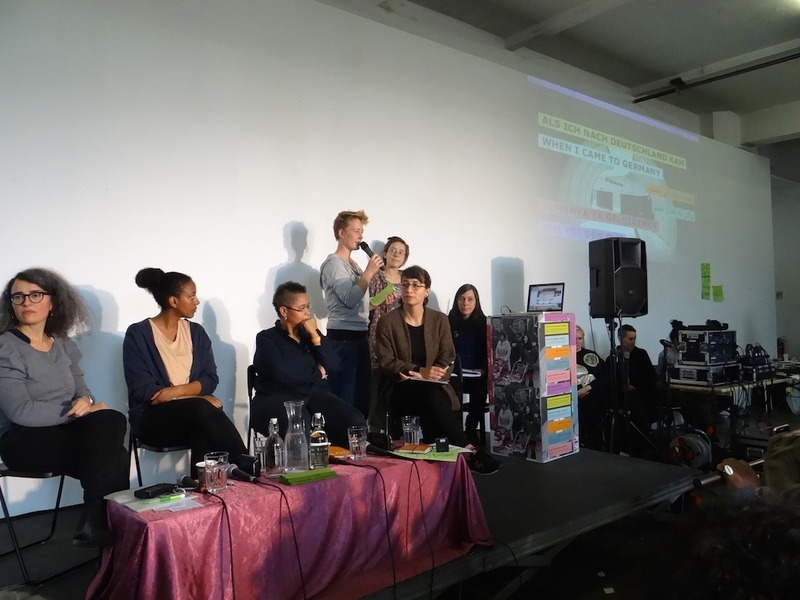 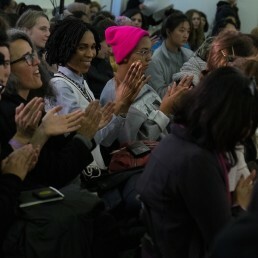 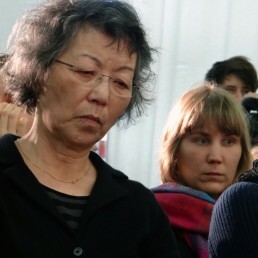 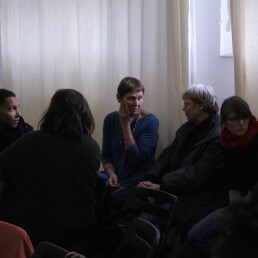 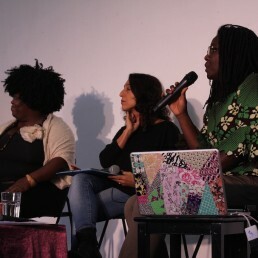 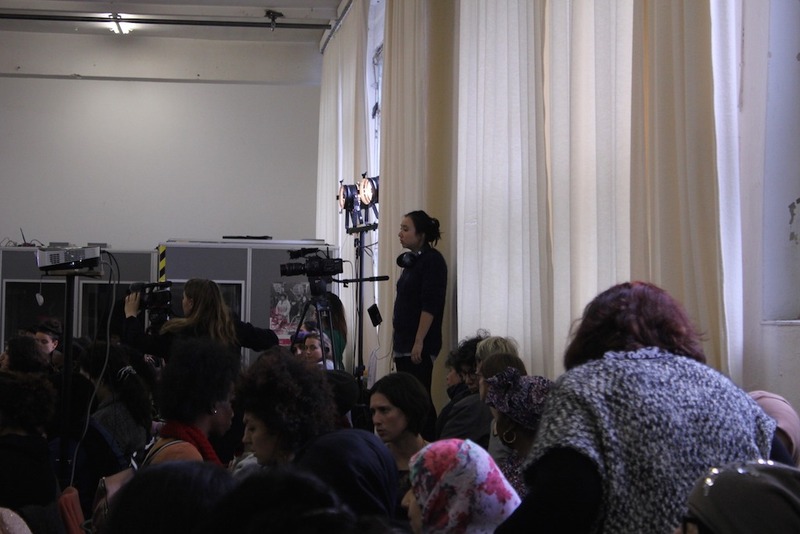 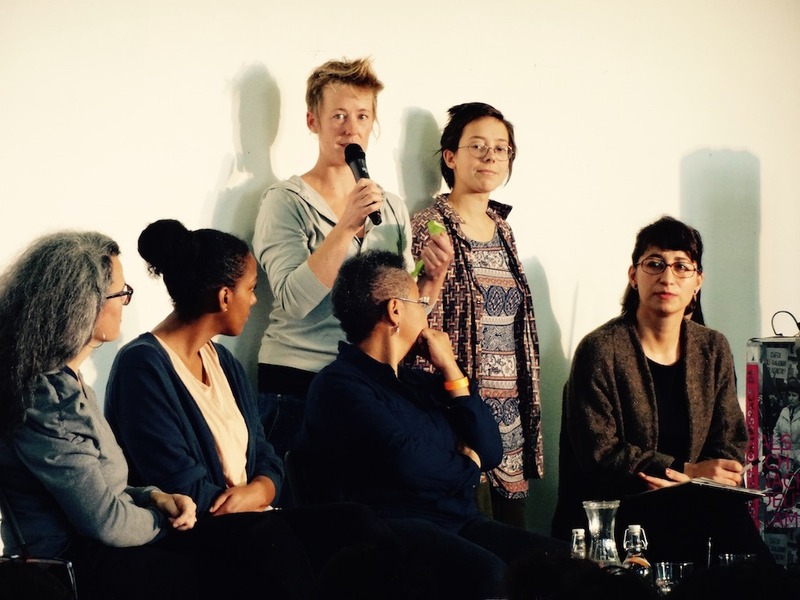 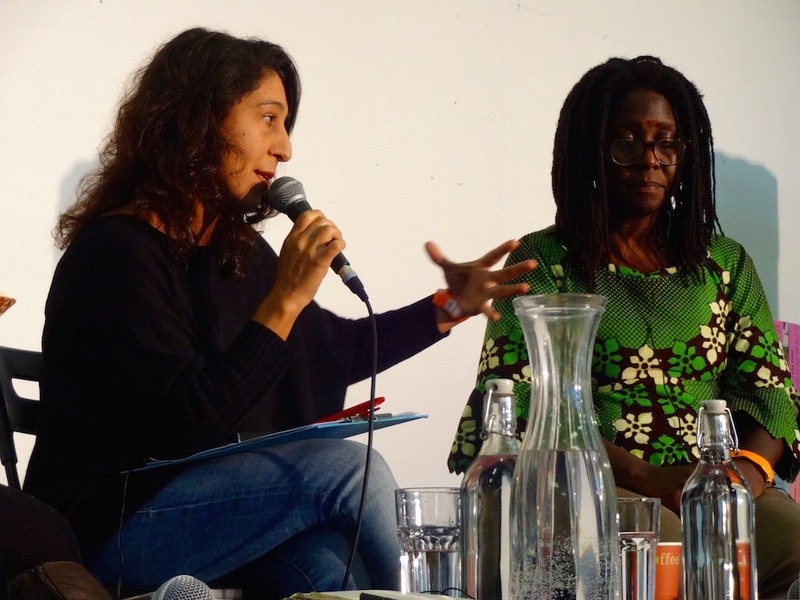 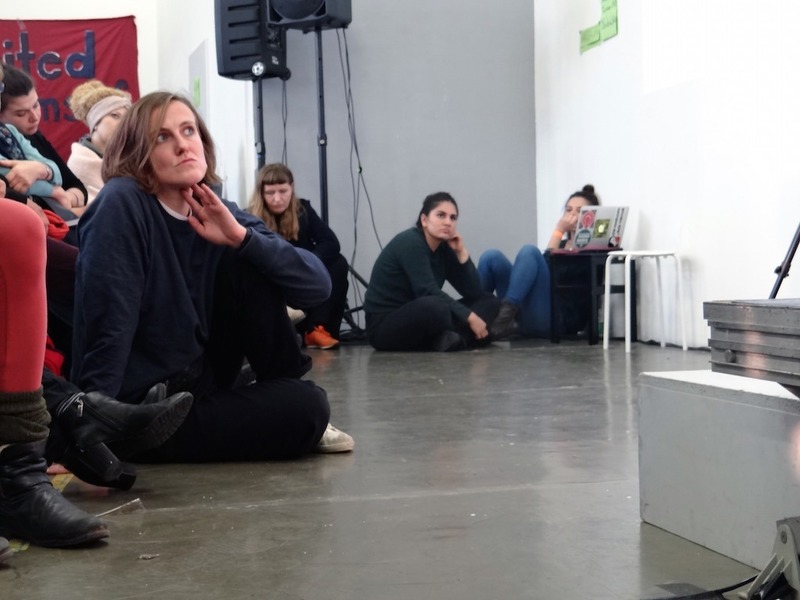 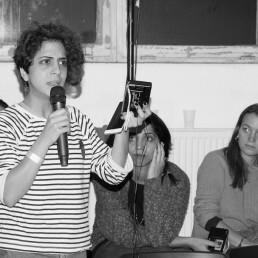 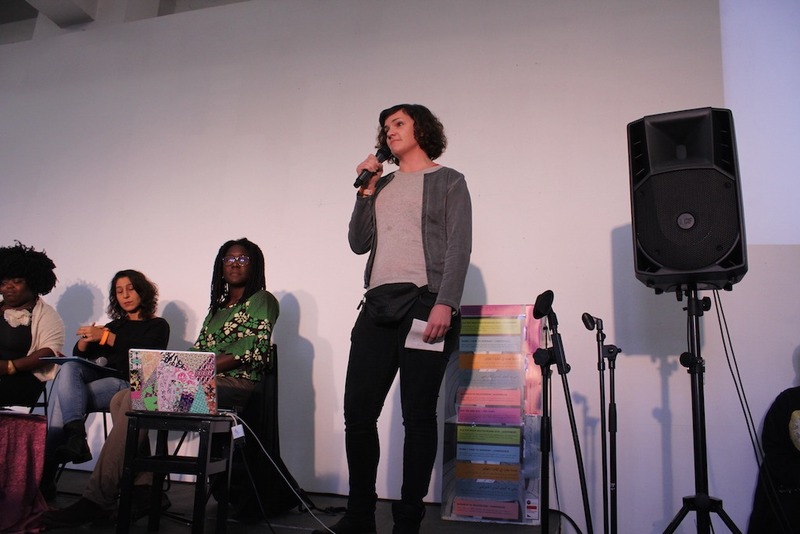 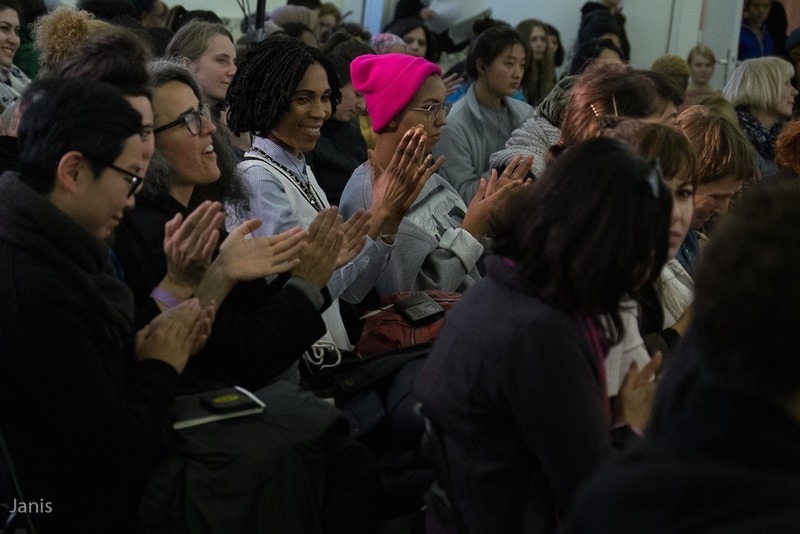 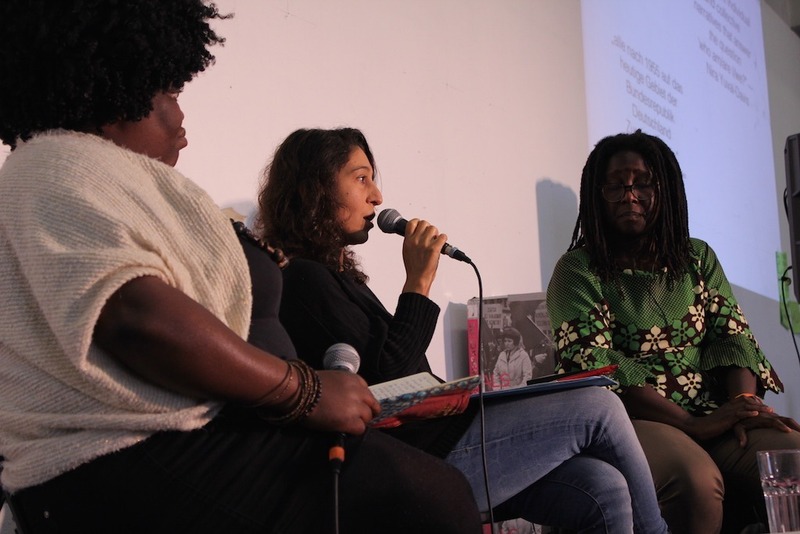 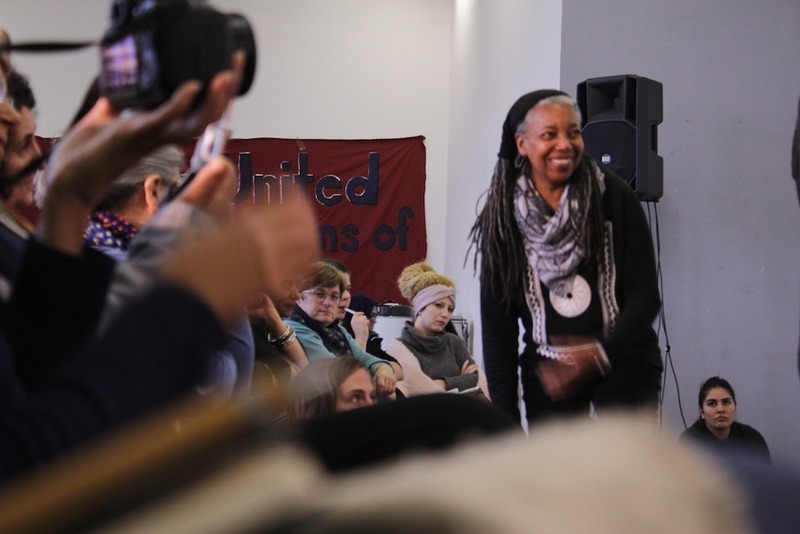 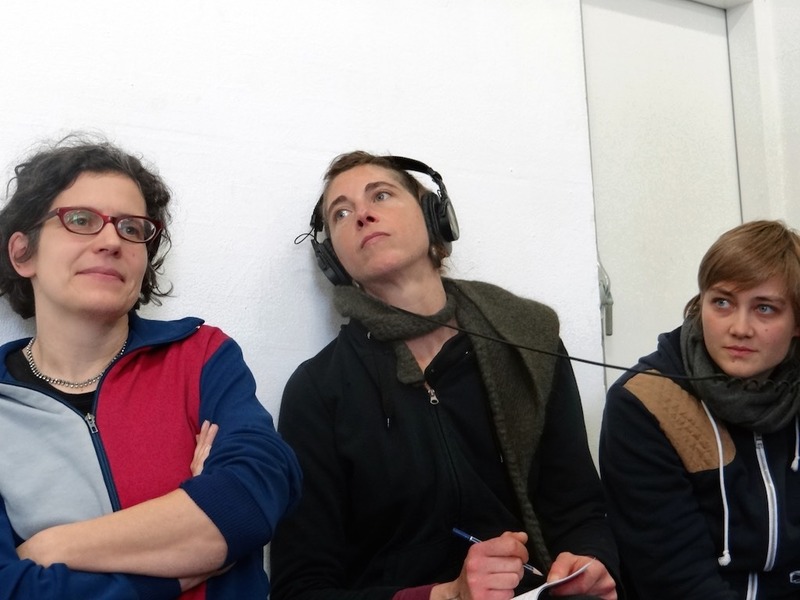 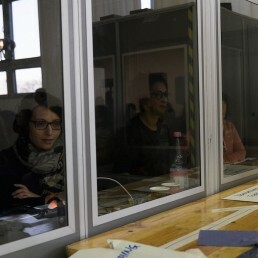 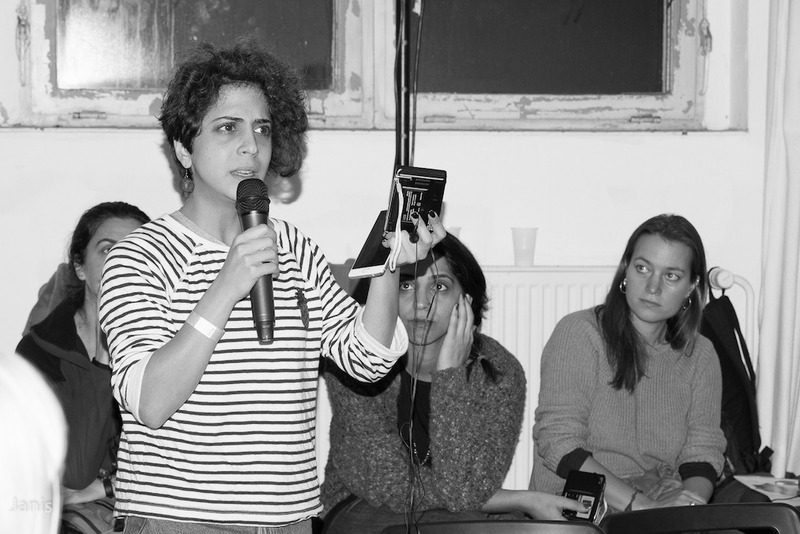 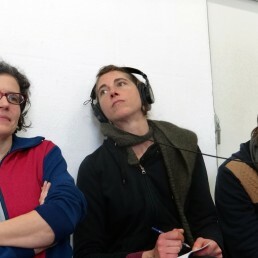 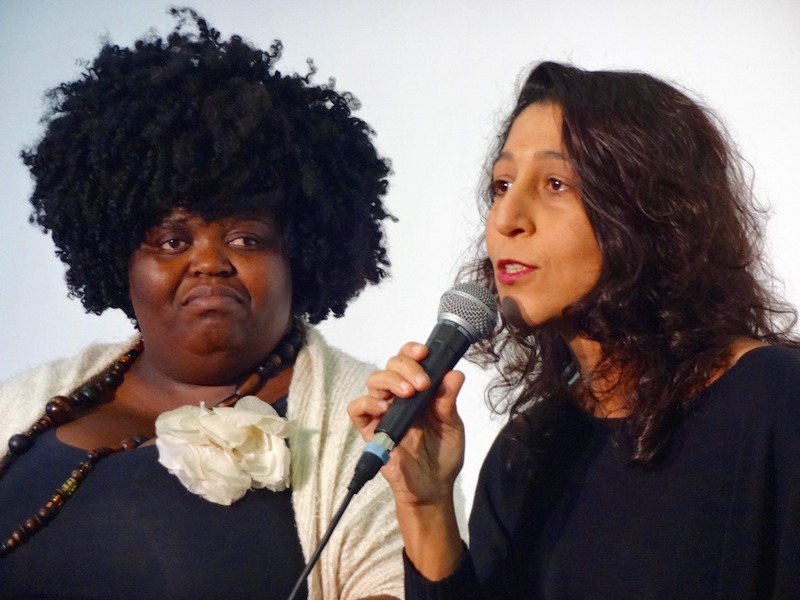 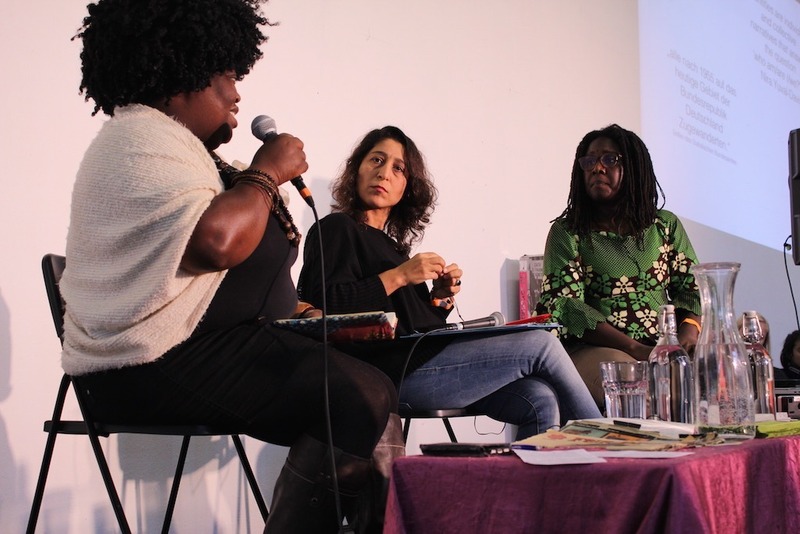 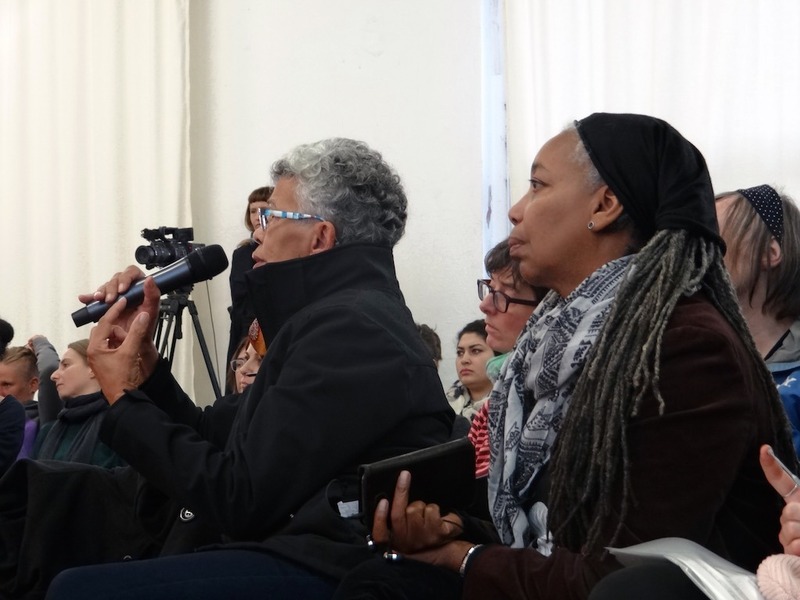 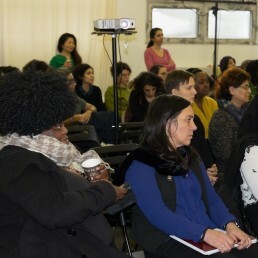 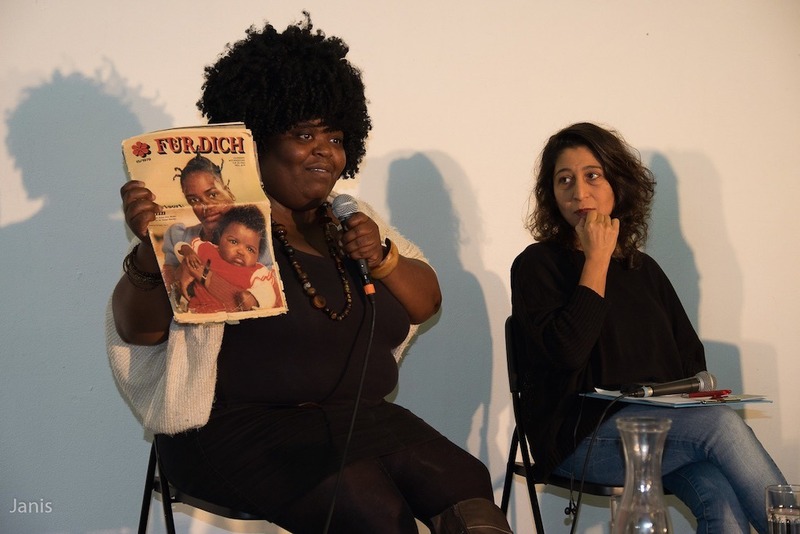 There were six-panel discussions focusing on the experiences of women who came to West Germany as guest workers, to East Germany as contract workers, as migrants and refugees to the reunified Germany and of German women who are affected by racism. 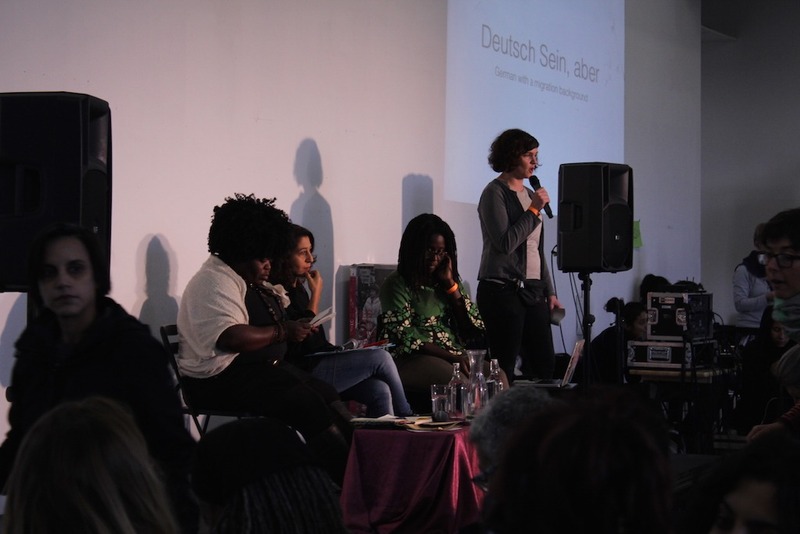 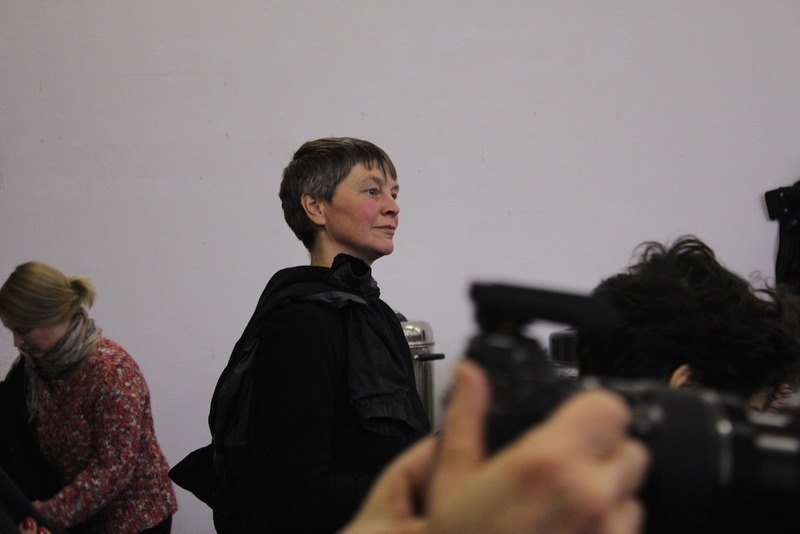 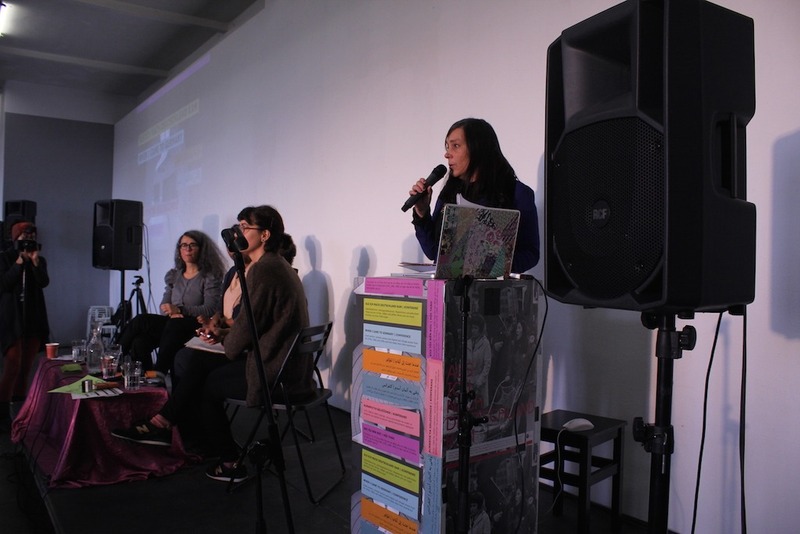 The invited speakers talked about and compared their experiences of arriving and settling in Germany as well as working and organising as women here. 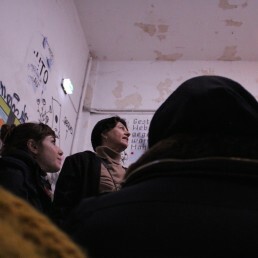 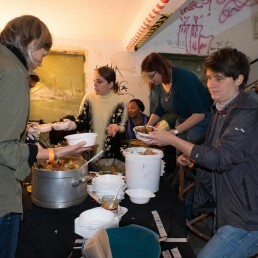 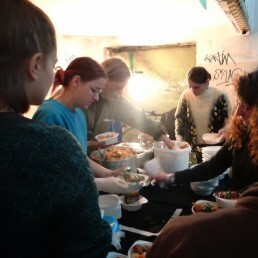 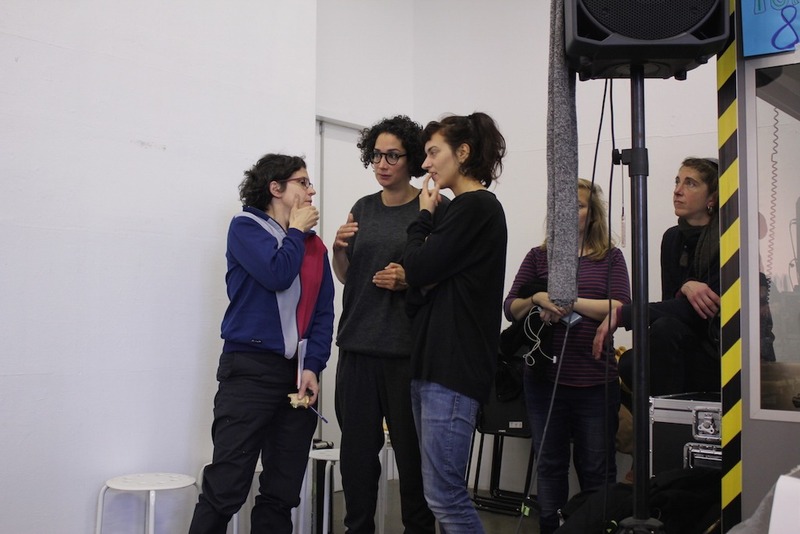 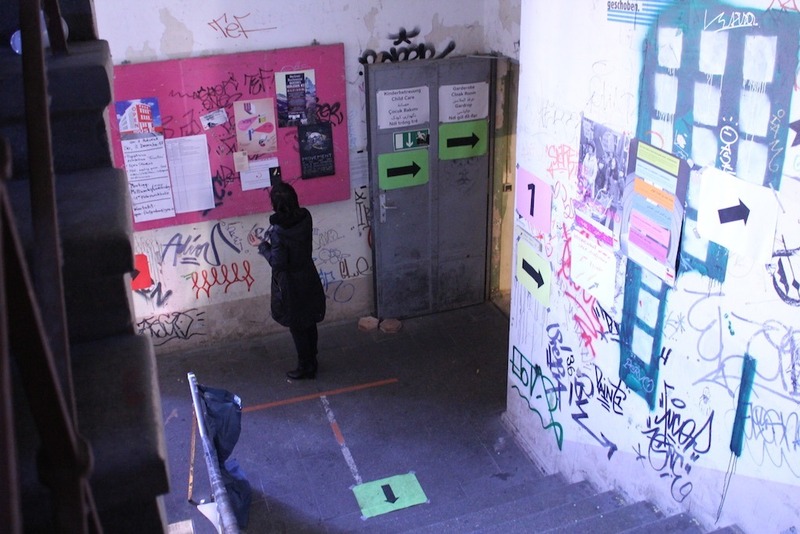 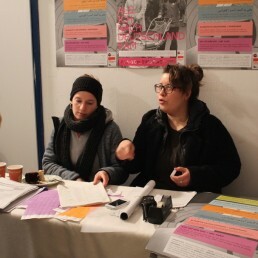 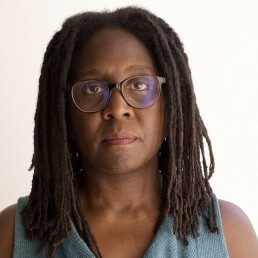 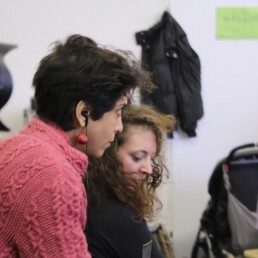 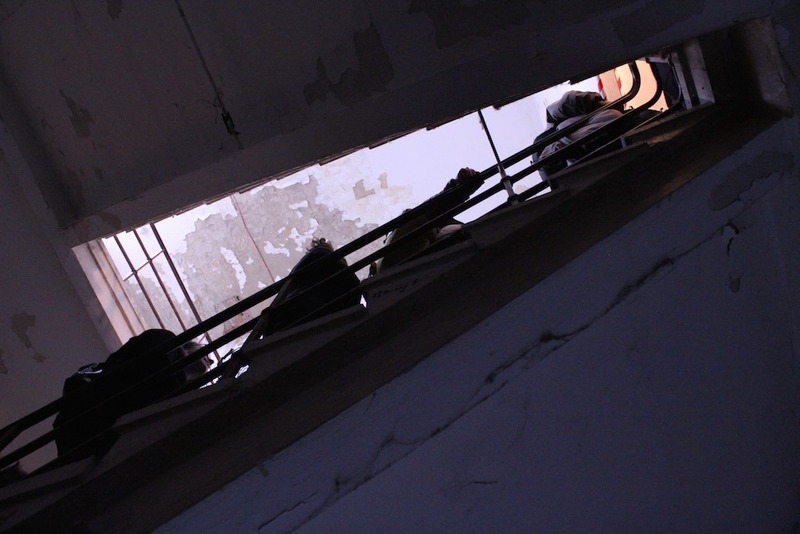 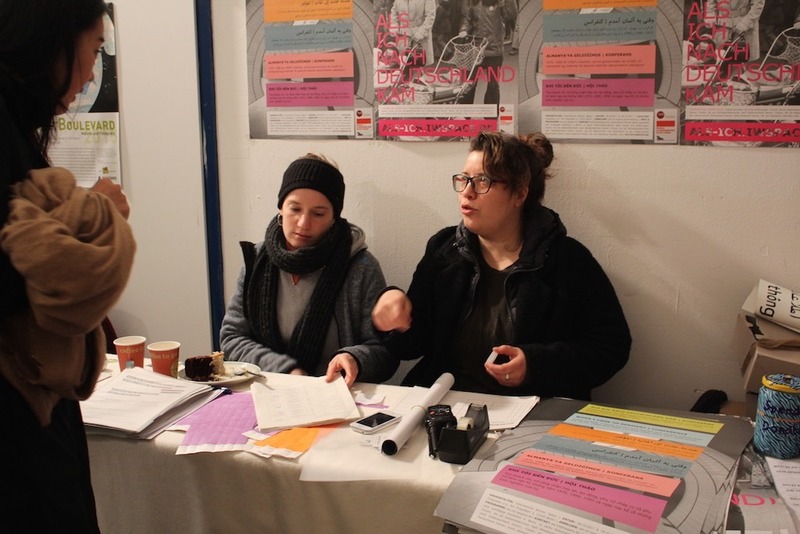 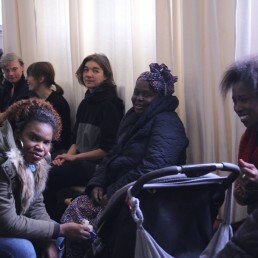 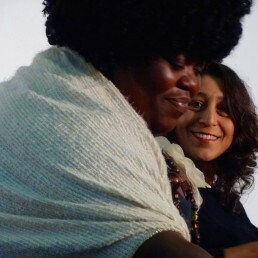 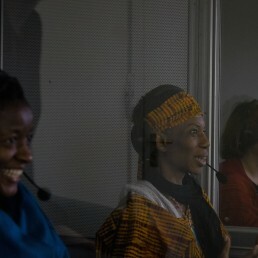 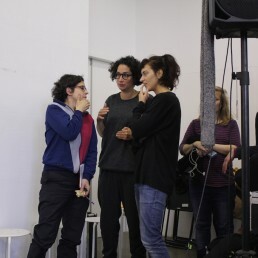 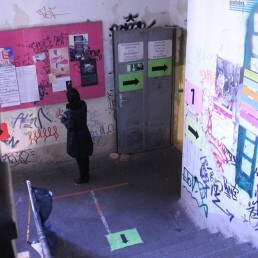 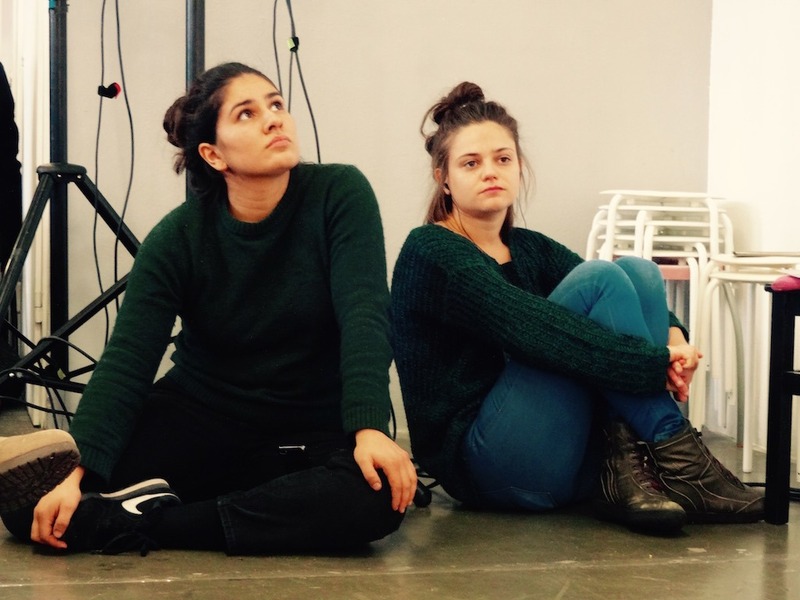 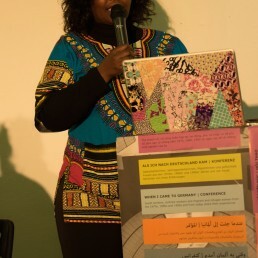 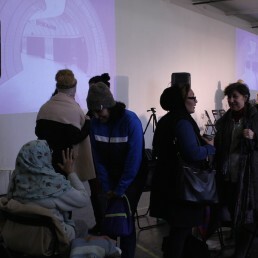 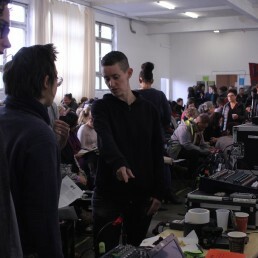 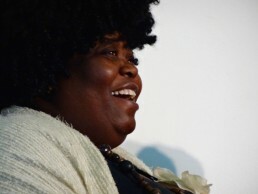 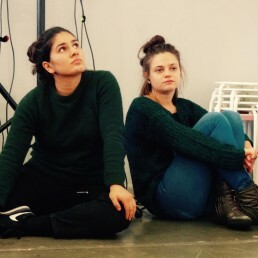 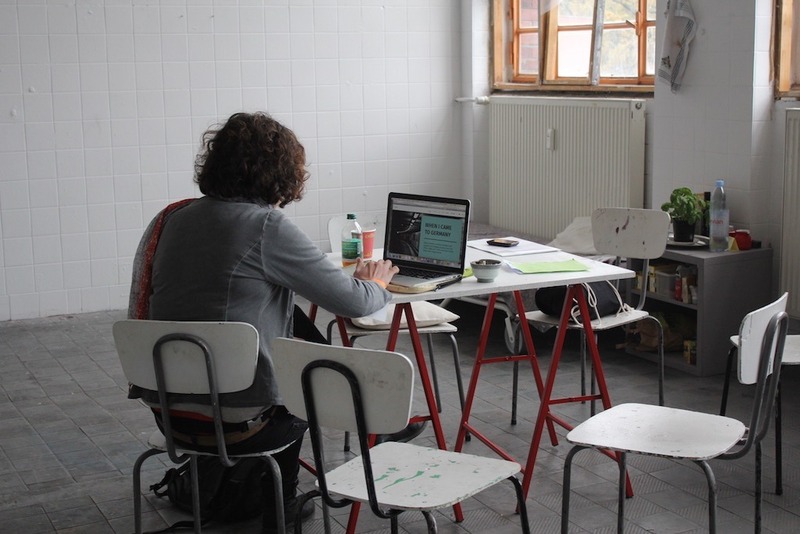 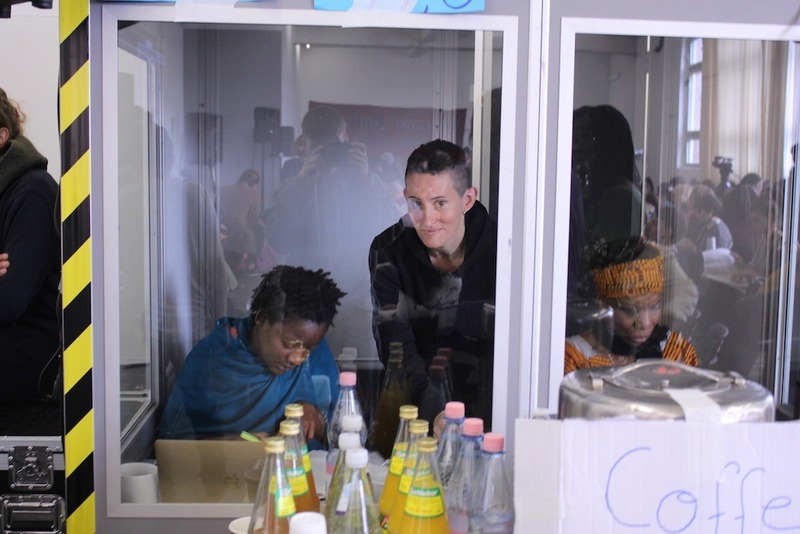 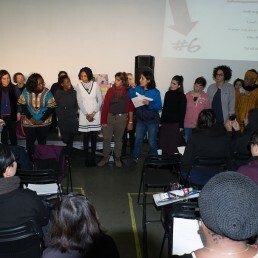 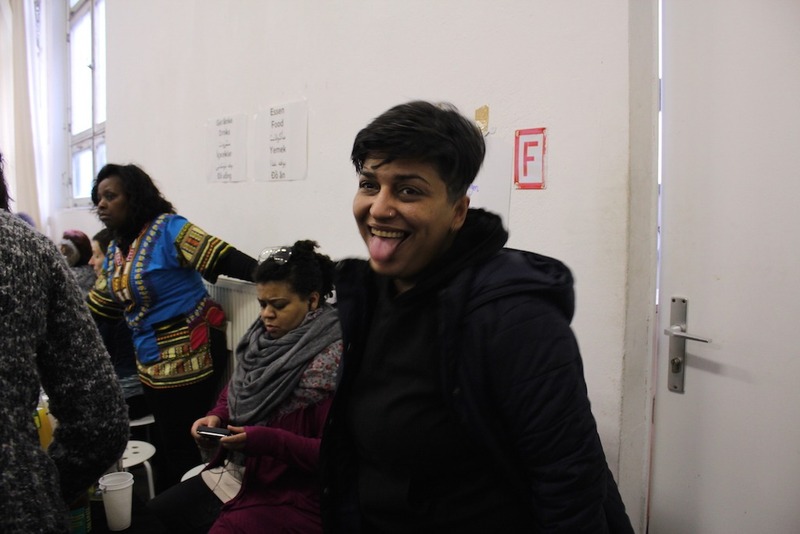 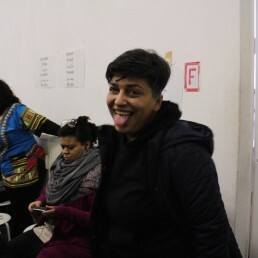 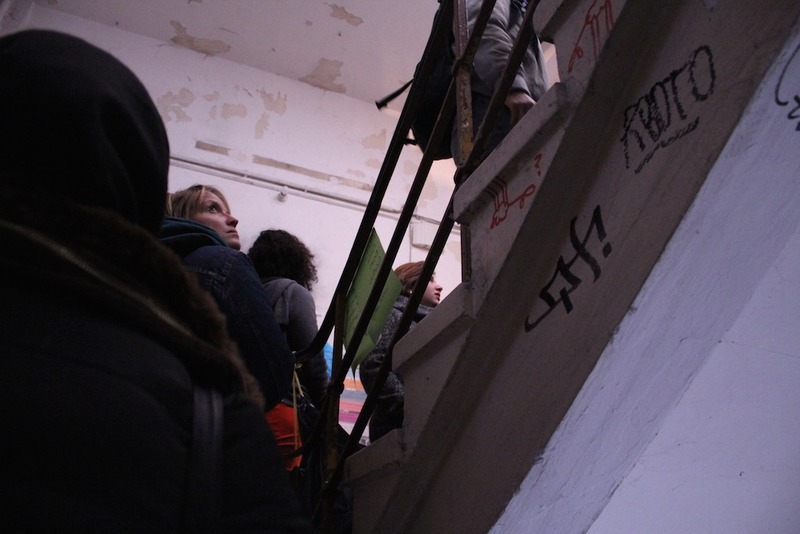 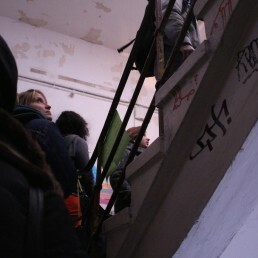 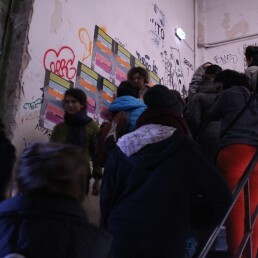 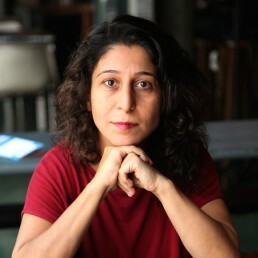 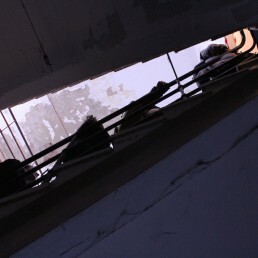 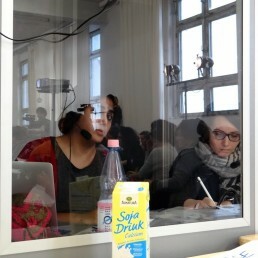 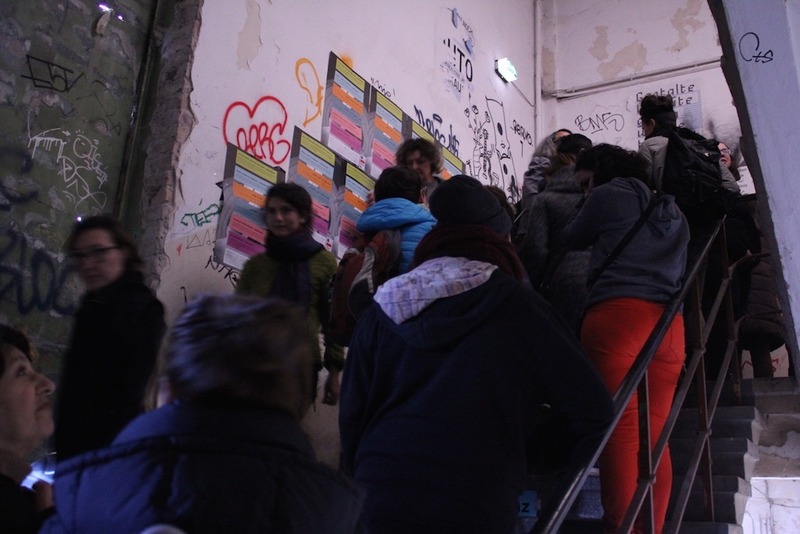 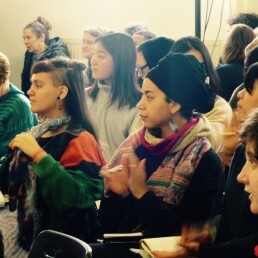 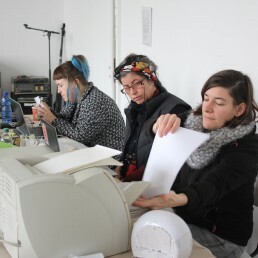 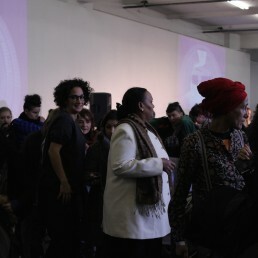 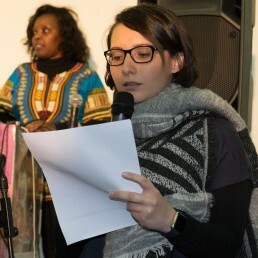 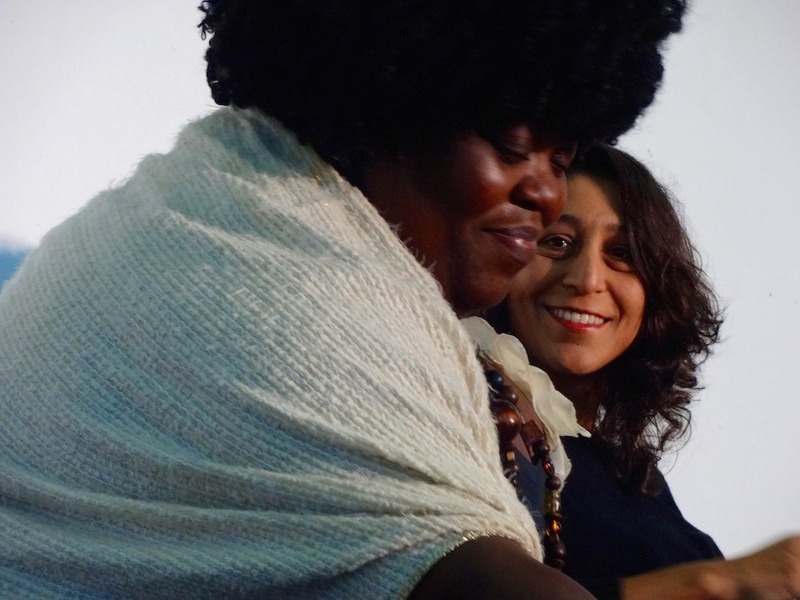 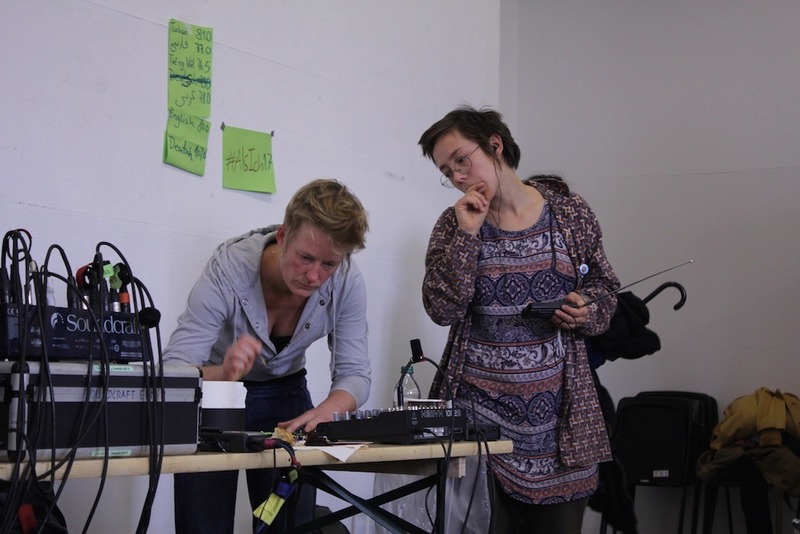 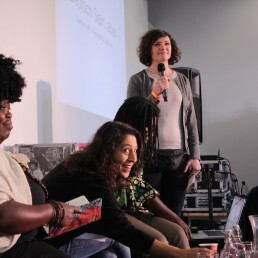 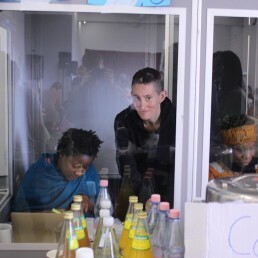 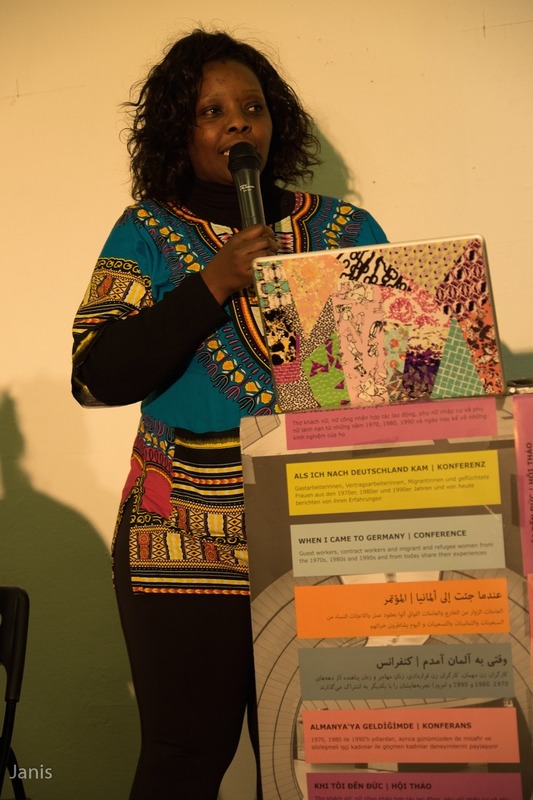 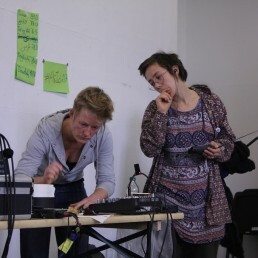 We wanted to put the knowledge of multiple generations of migrants into a historical perspective, and create a space where we can exchange our individual and collective experiences in order to counteract false ideas of victimhood related to migrant women, whose voices are too often ignored in German society due to racism, xenophobia and sexism. 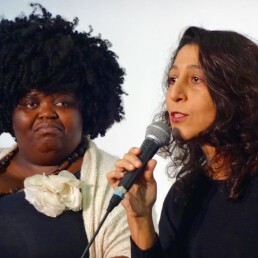 We wanted to counteract the mainstream narrative. 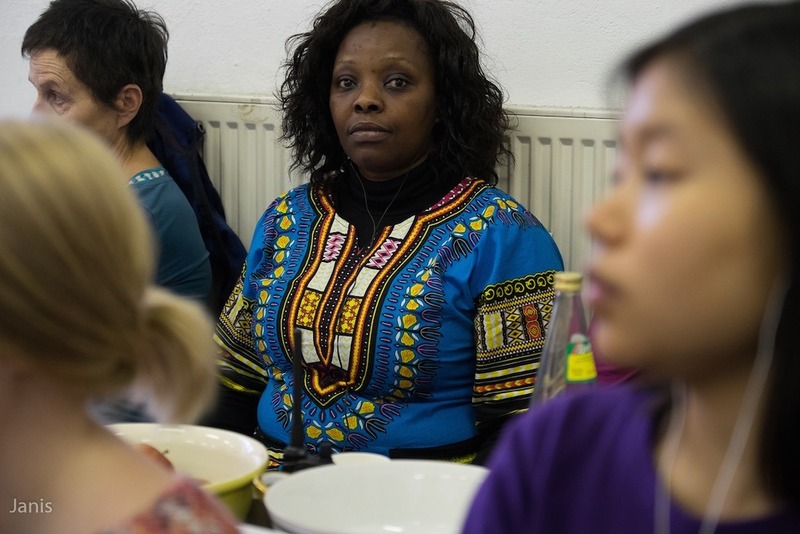 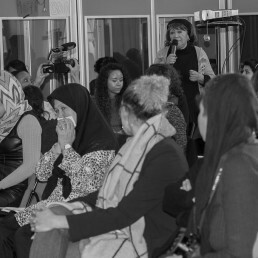 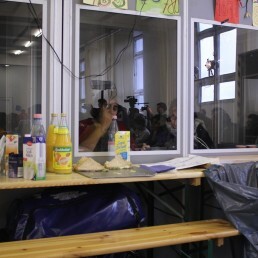 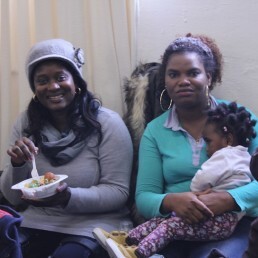 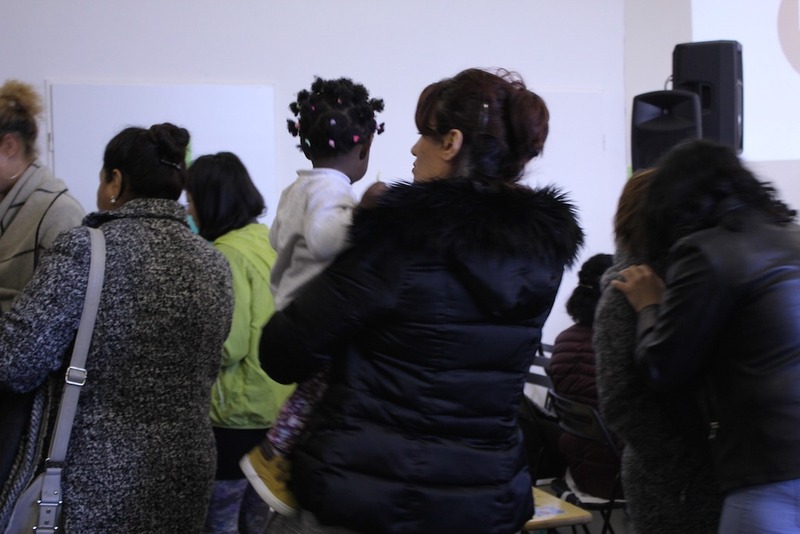 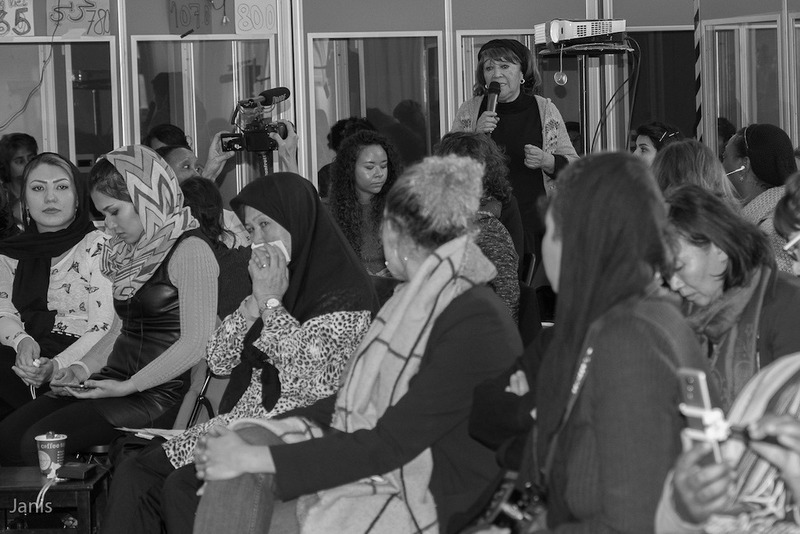 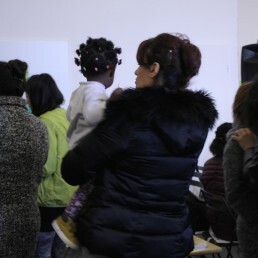 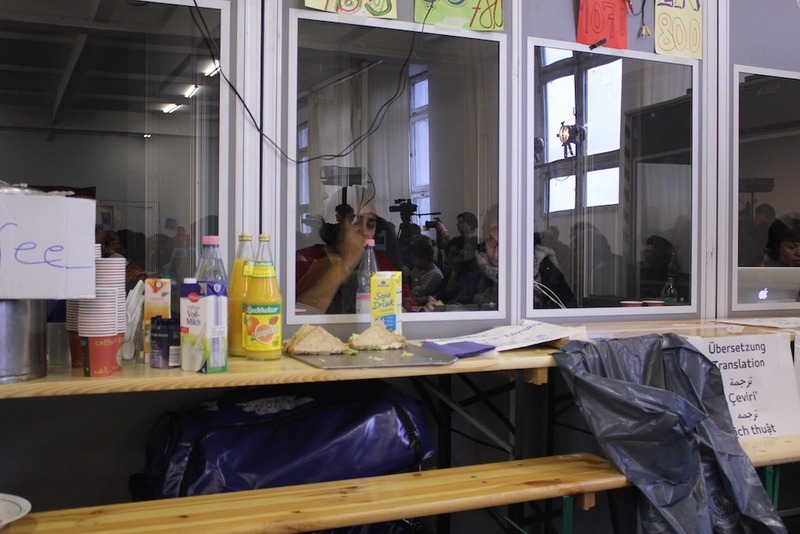 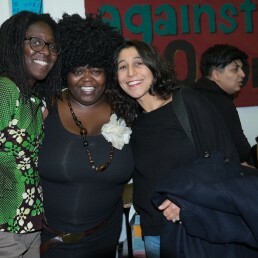 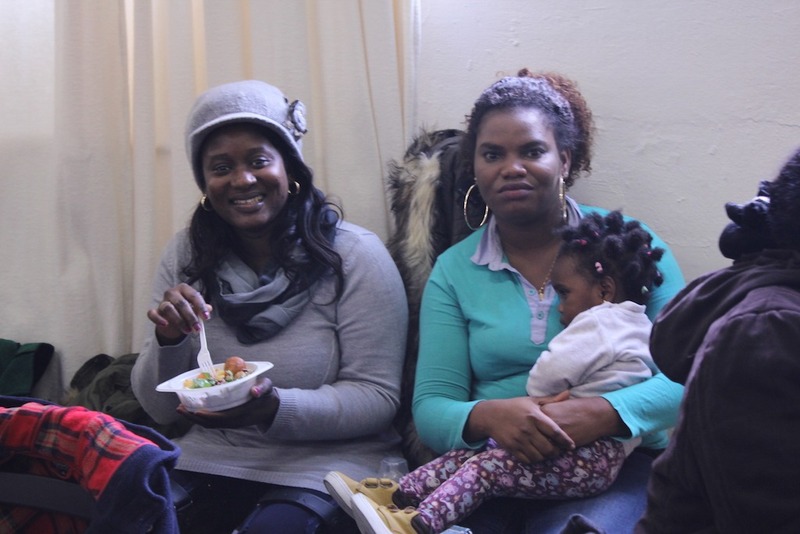 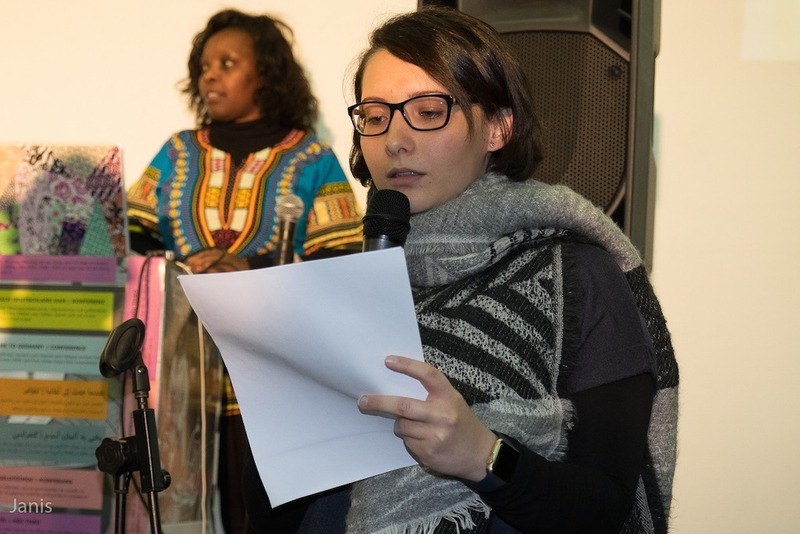 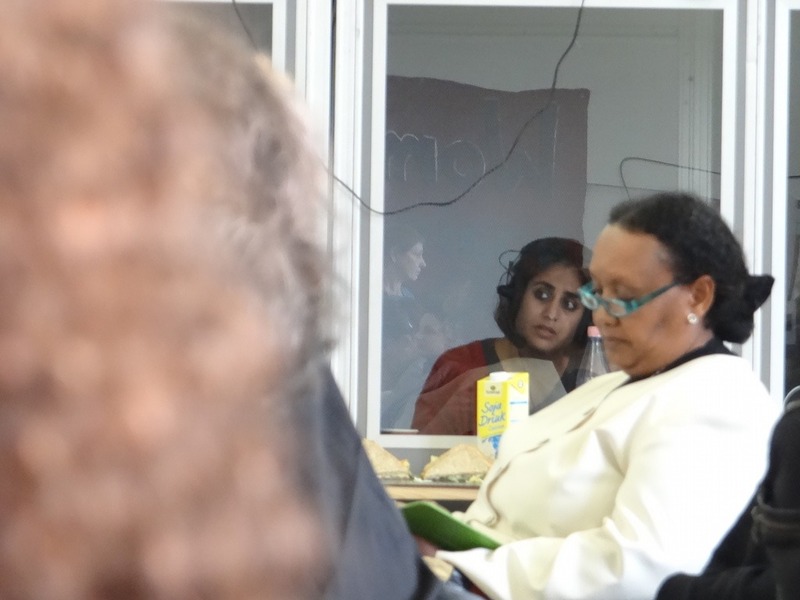 We did not only focus on the problems that migrant and refugee women, as well as German women who are affected by racism, are constantly confronted with. 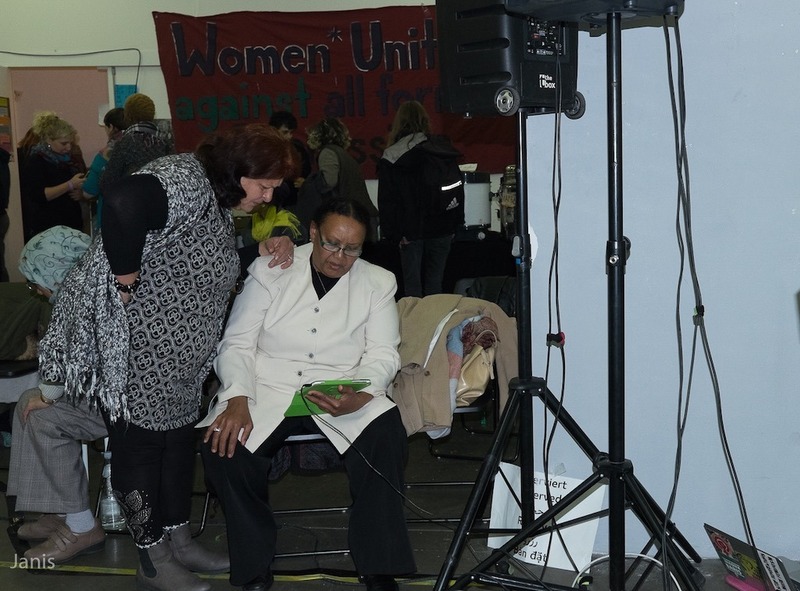 We also highlighted the many and various forms of women’s resistance; in the workplace, in society and against institutional oppression. 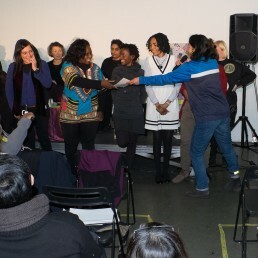 It was a success! 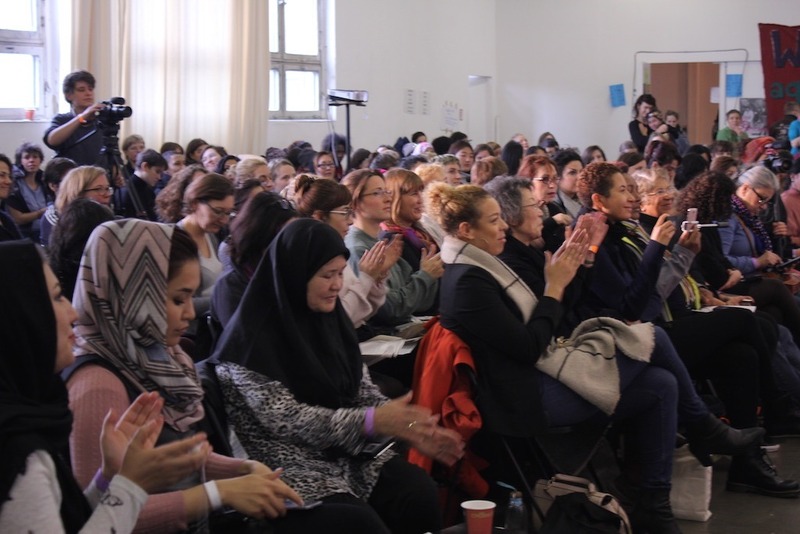 We were very moved and inspired by the response to the conference, both before, during and after. 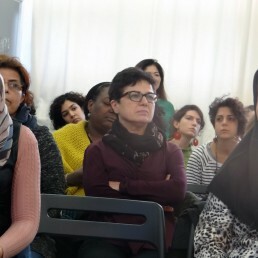 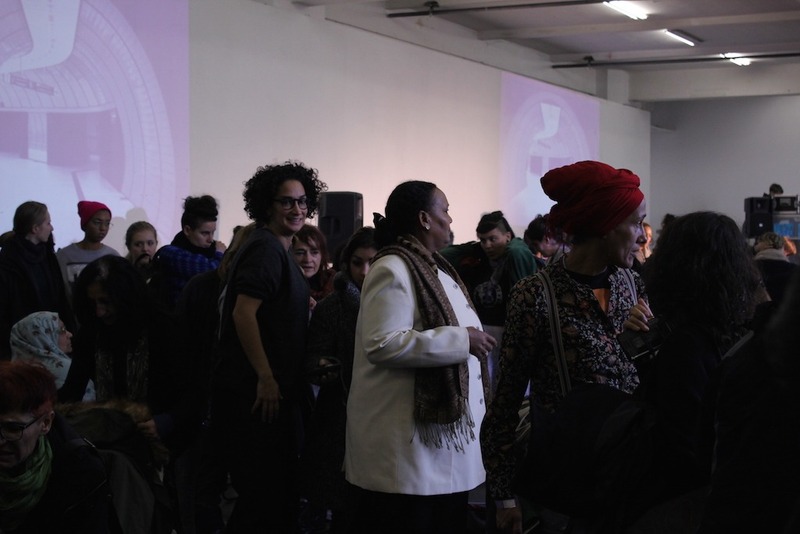 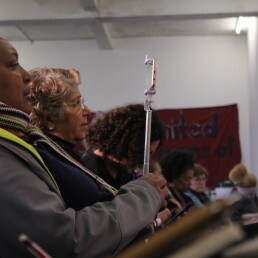 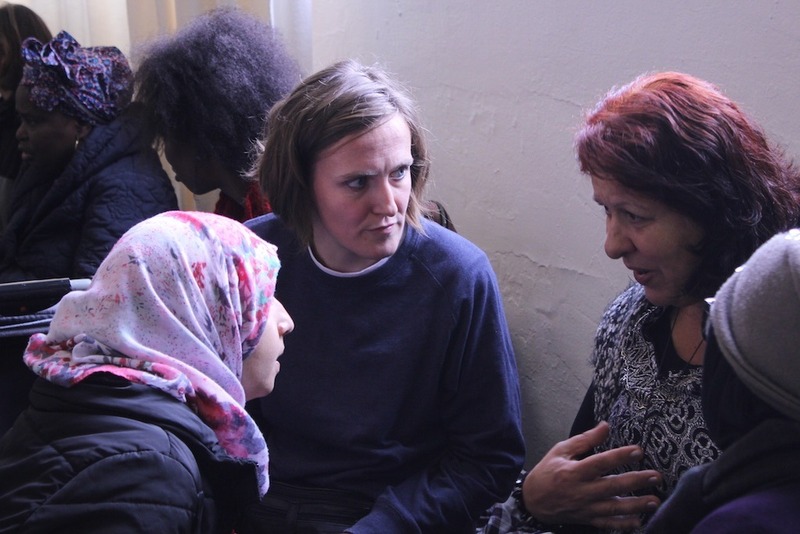 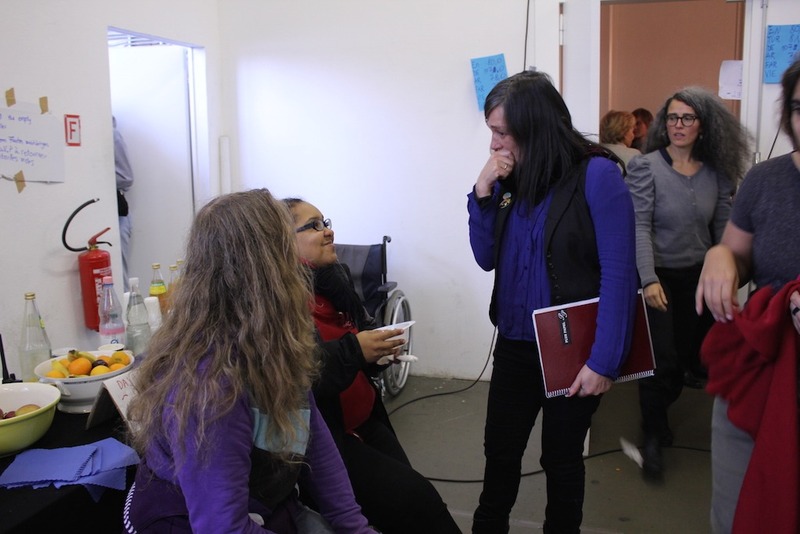 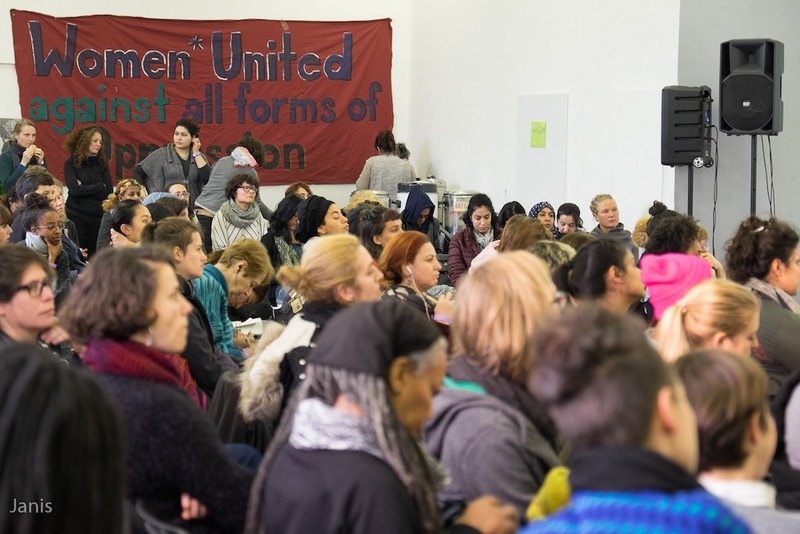 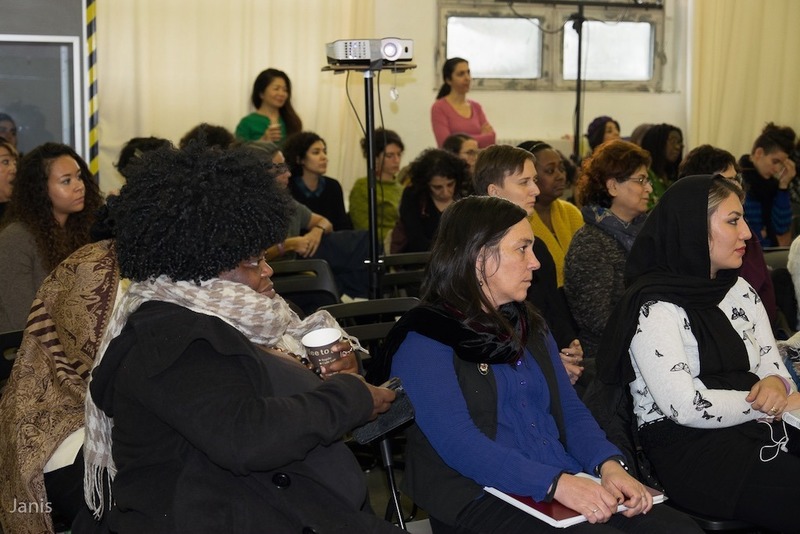 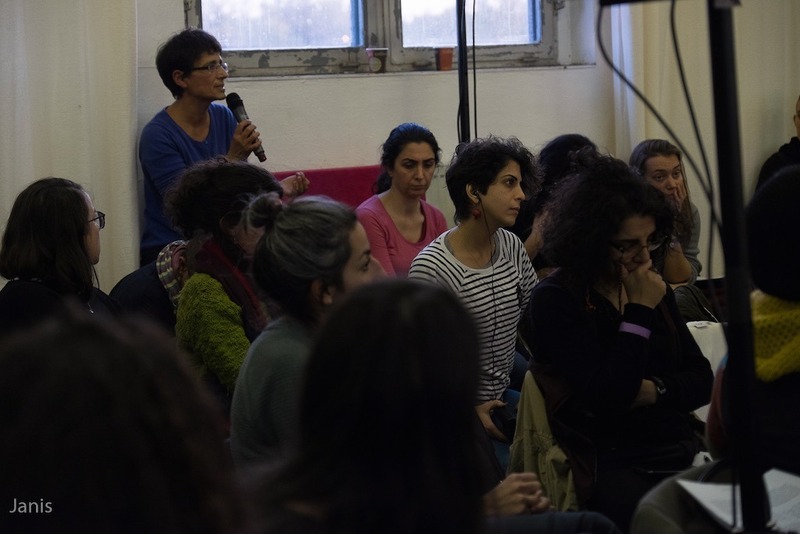 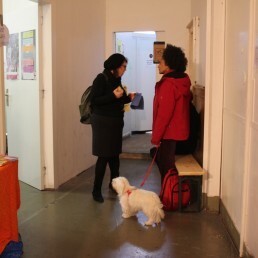 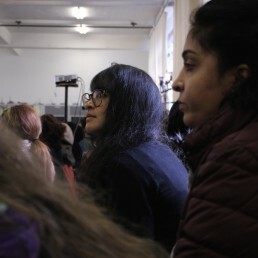 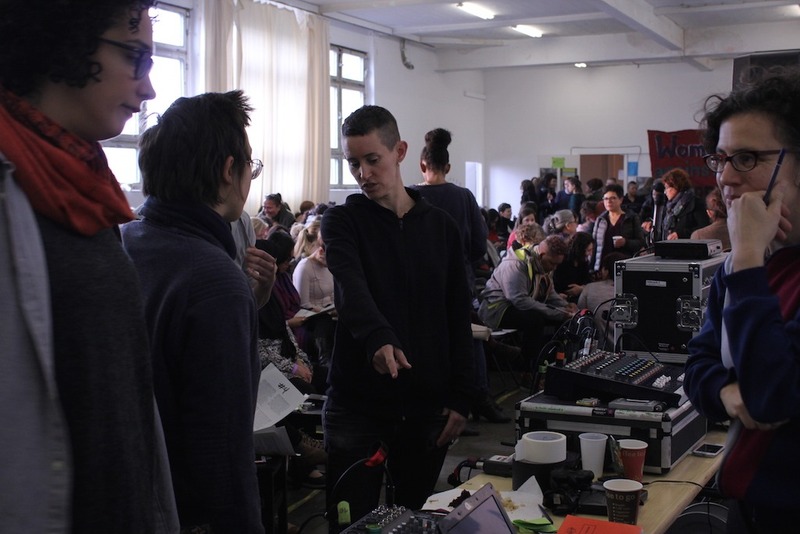 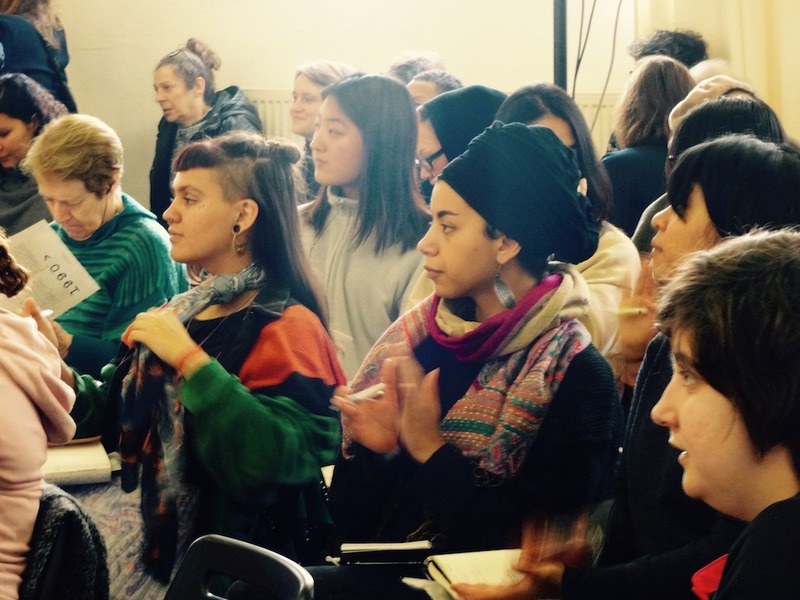 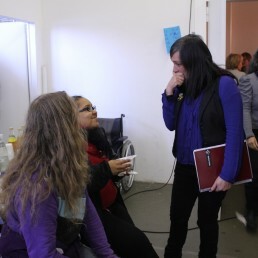 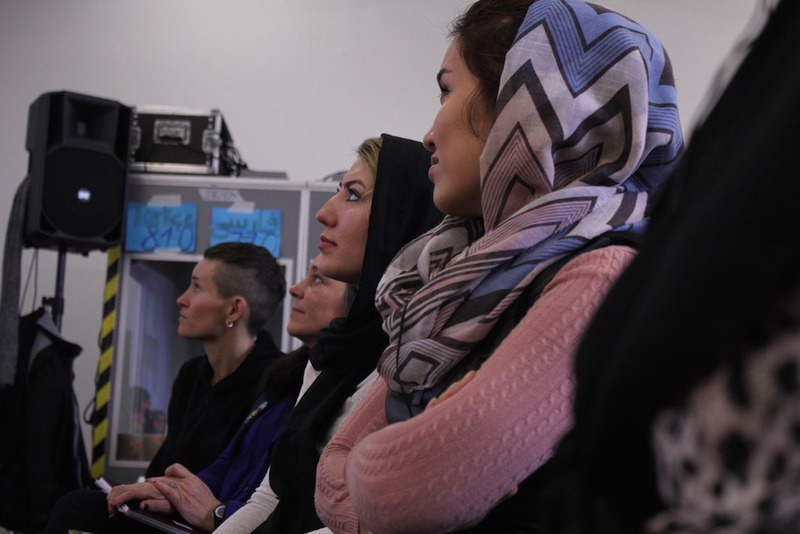 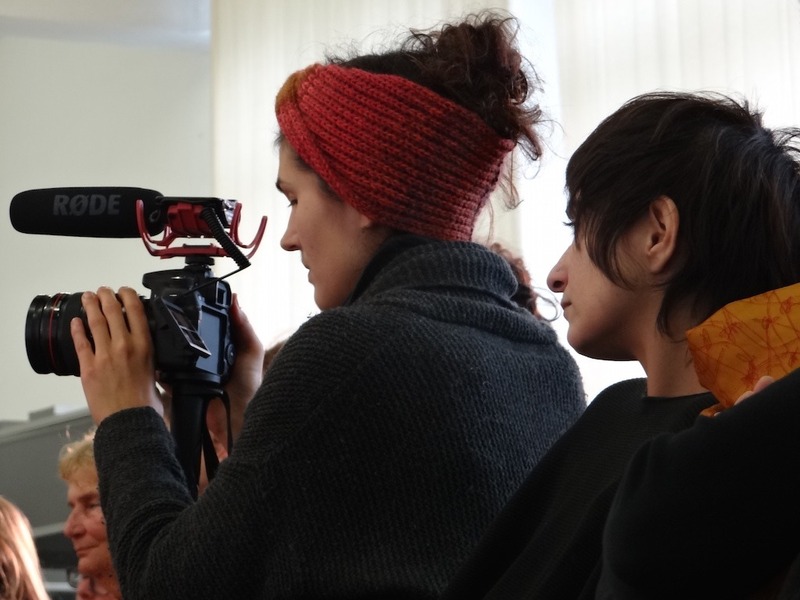 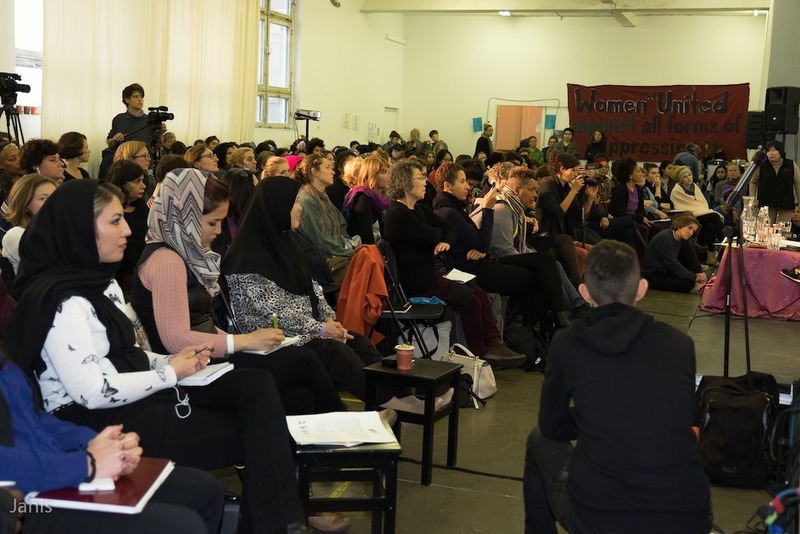 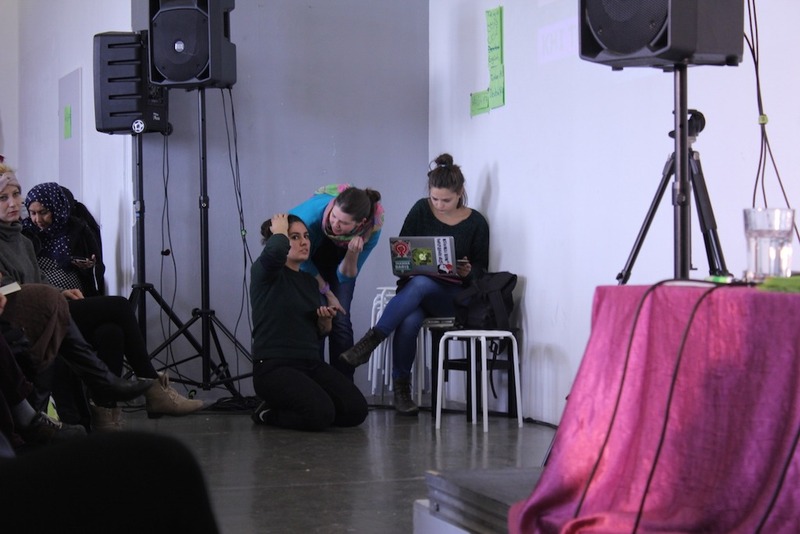 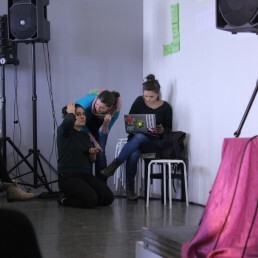 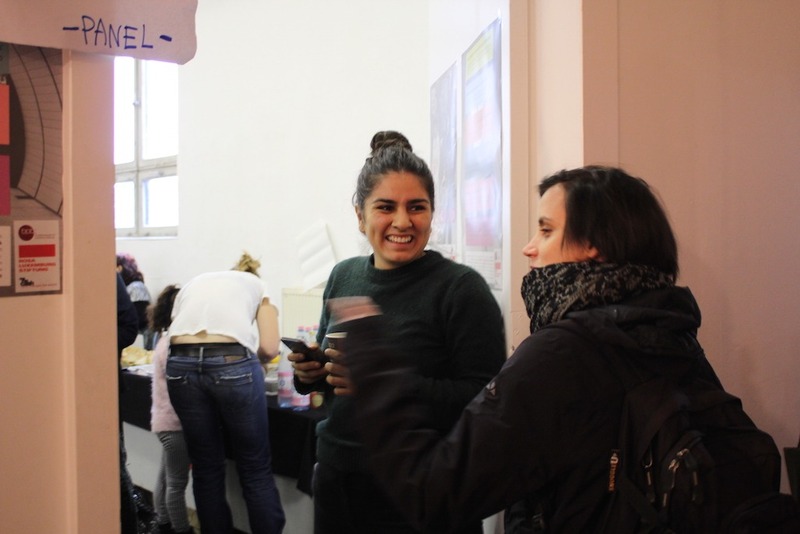 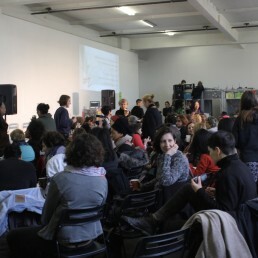 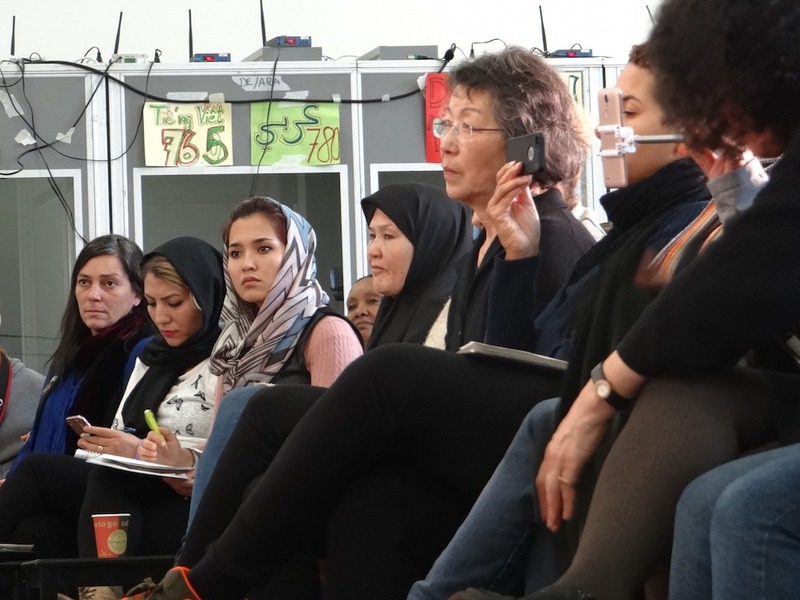 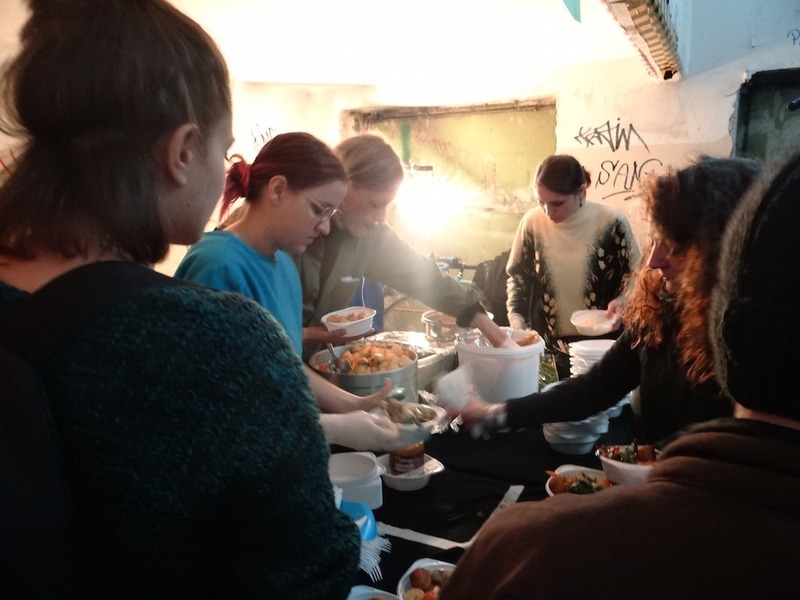 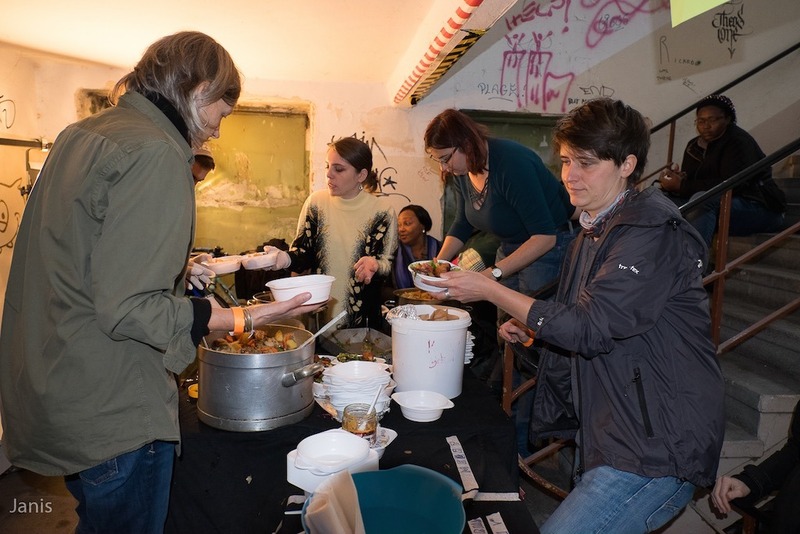 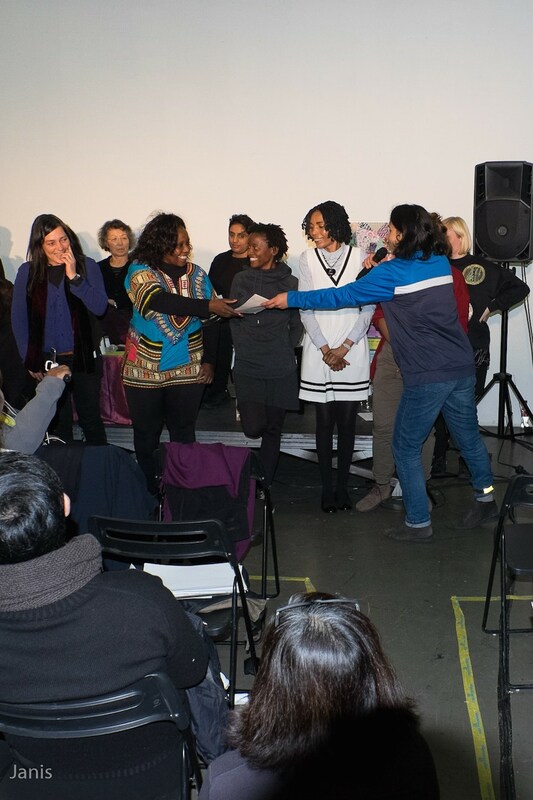 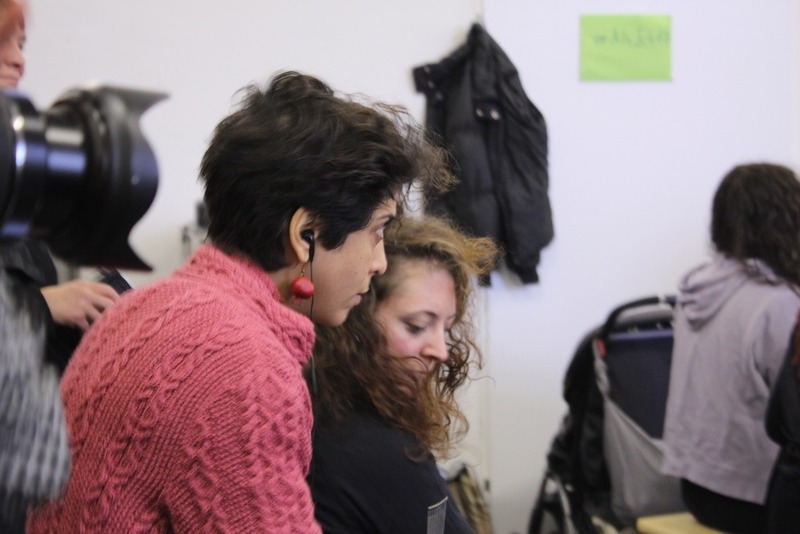 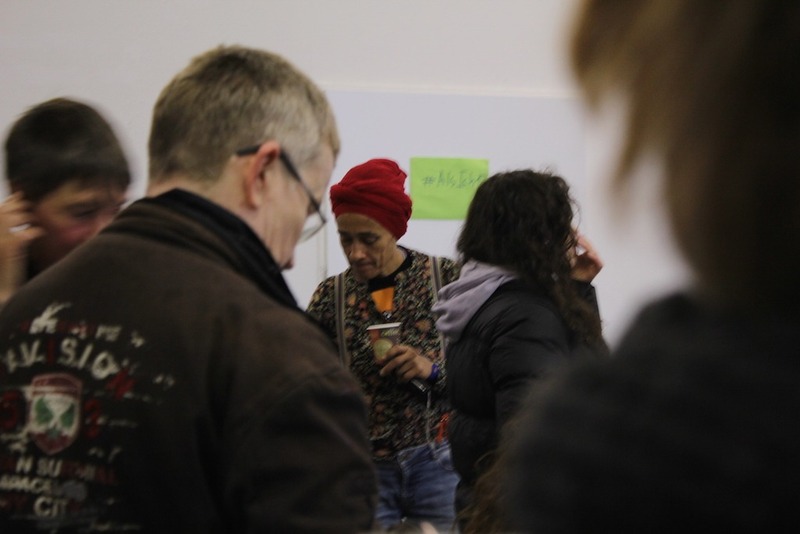 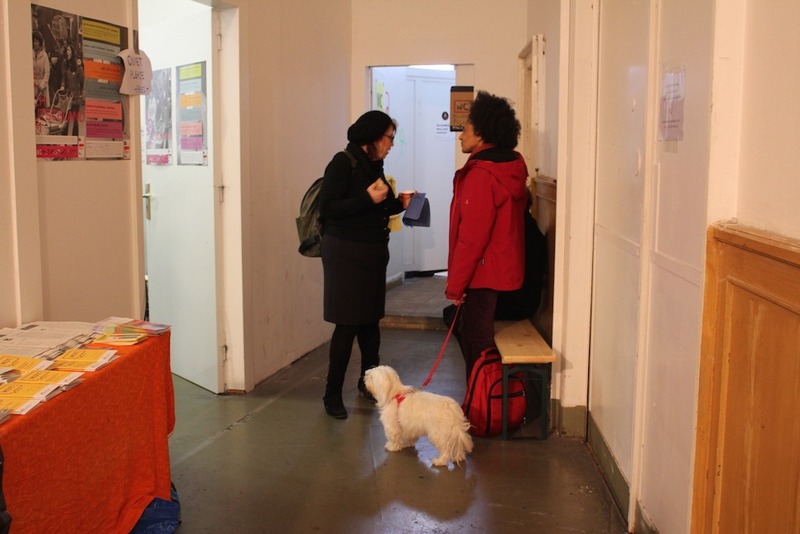 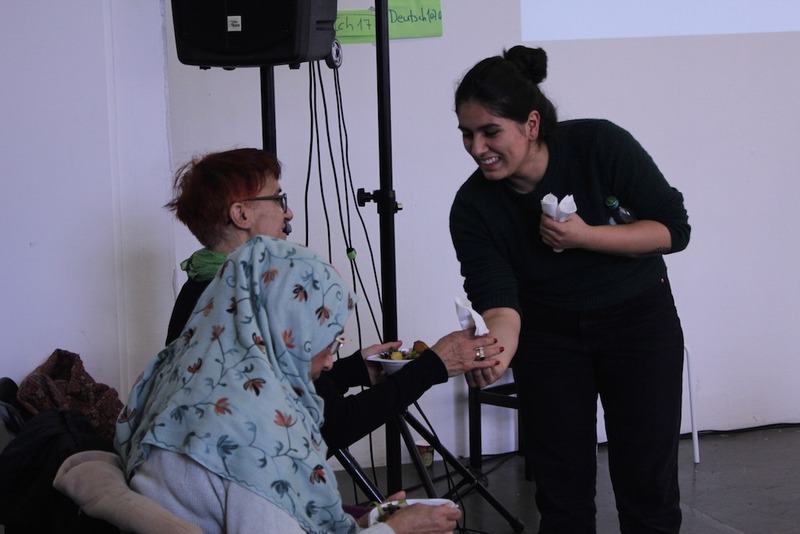 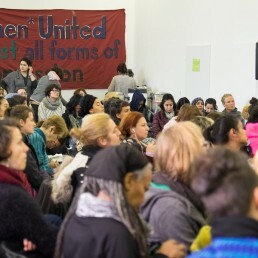 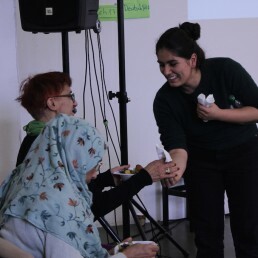 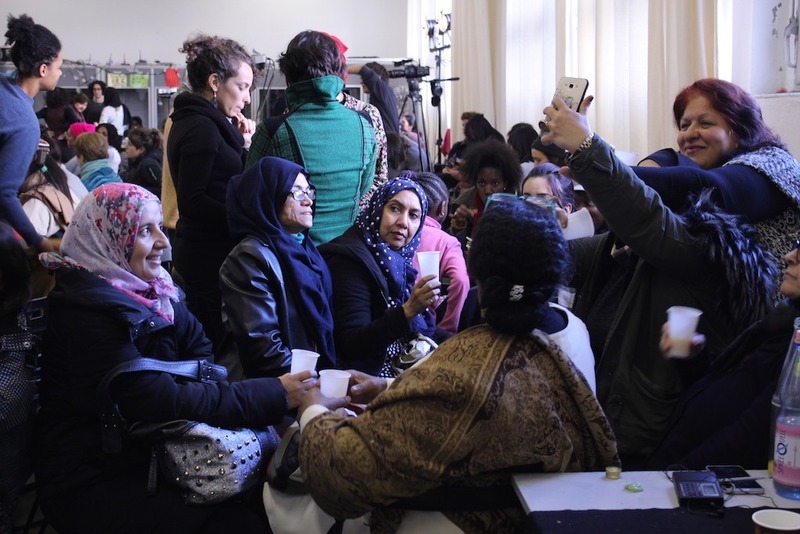 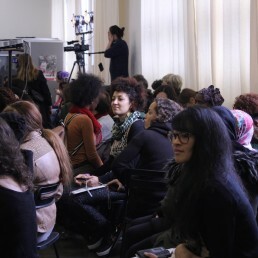 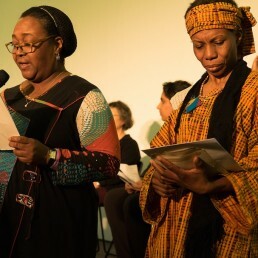 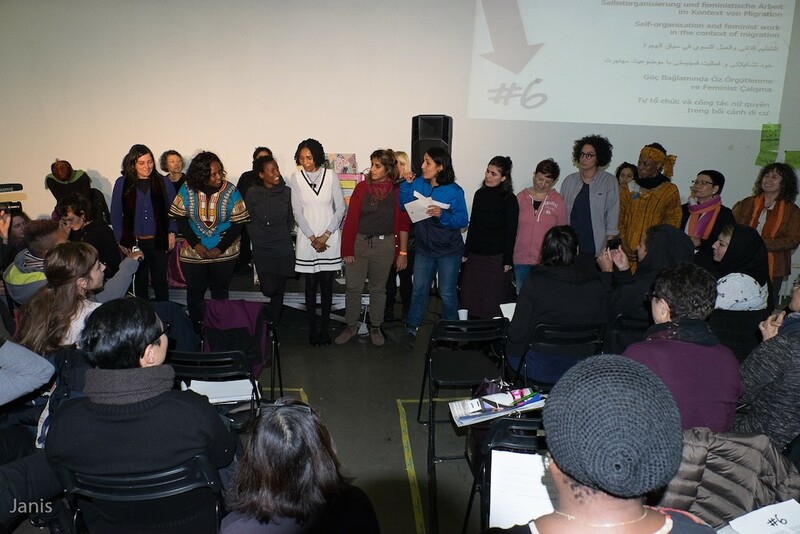 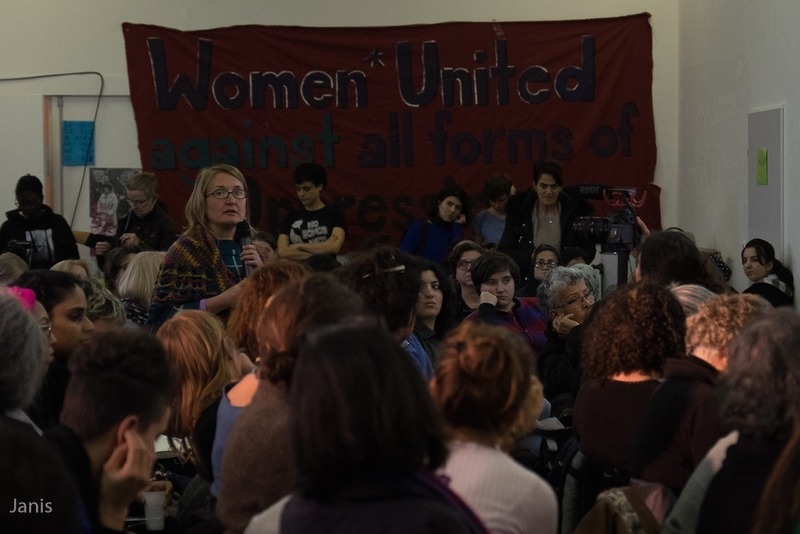 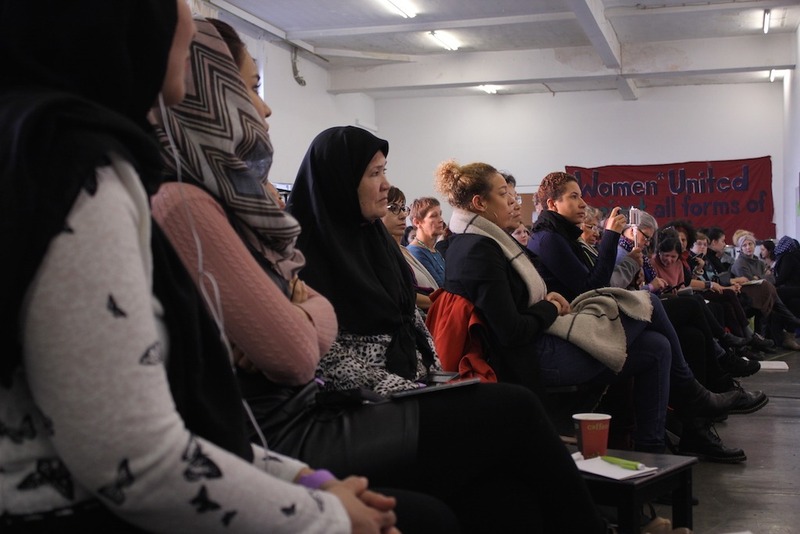 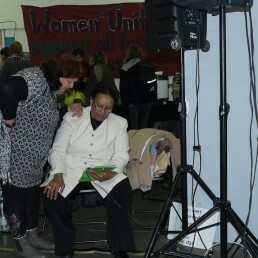 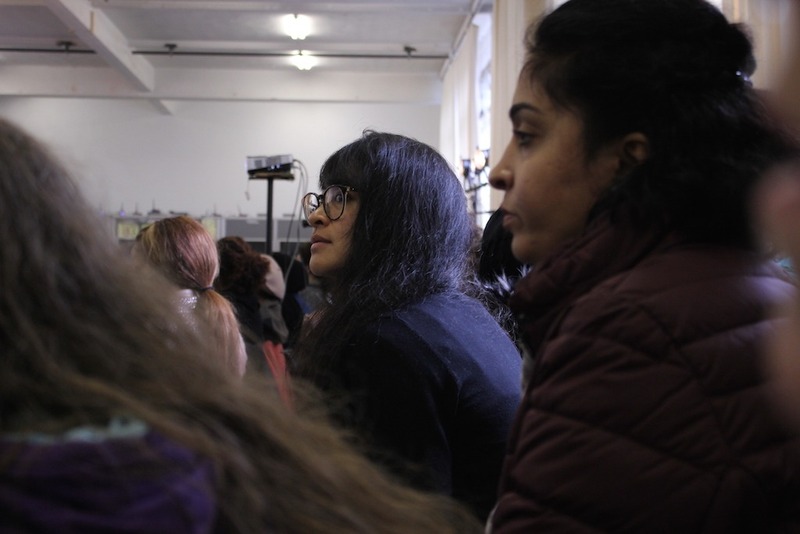 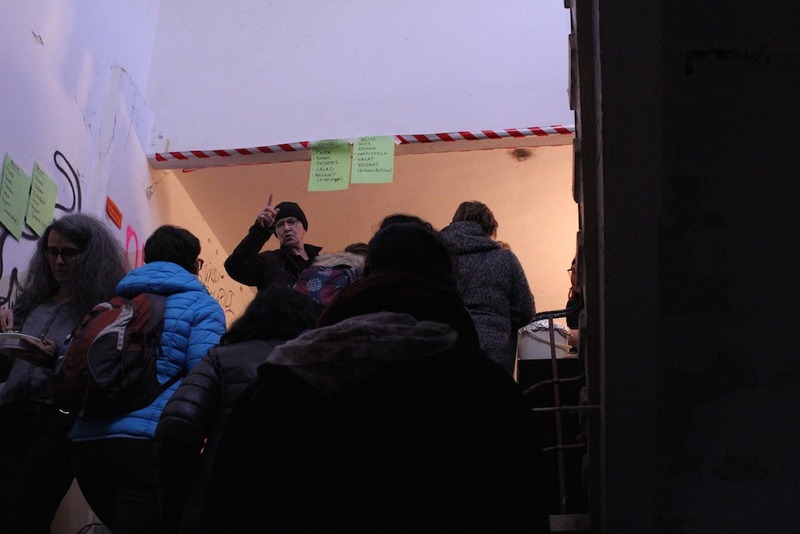 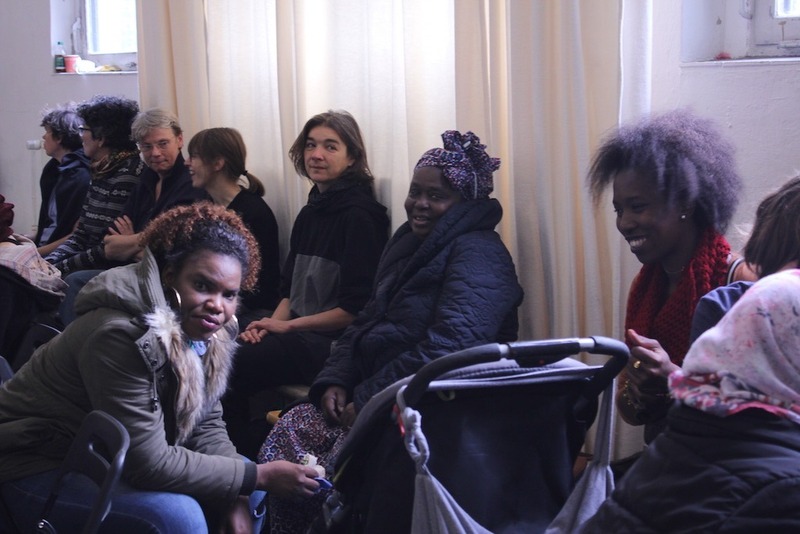 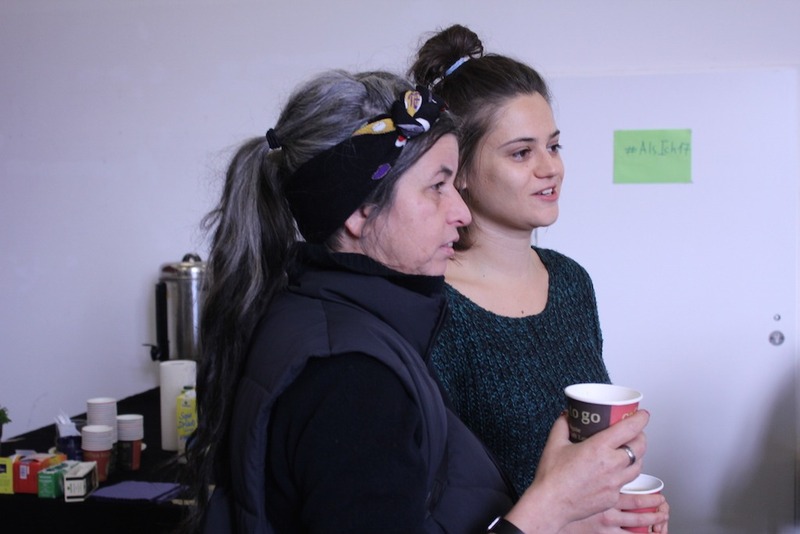 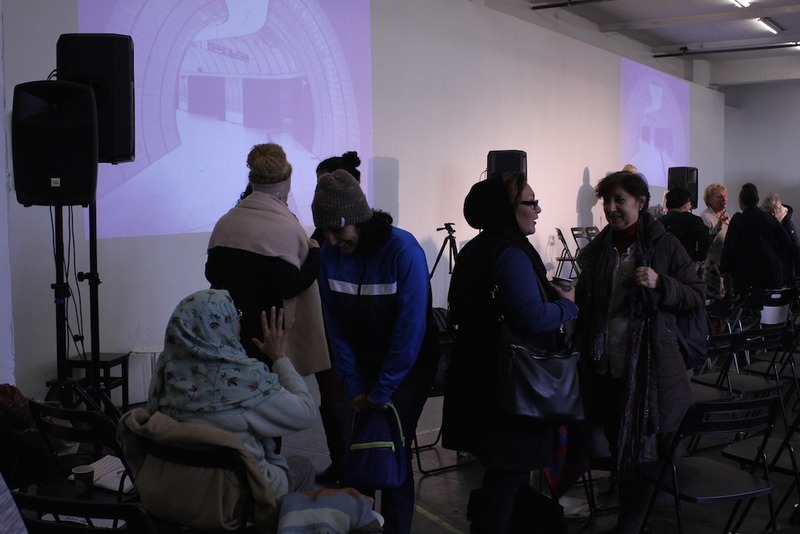 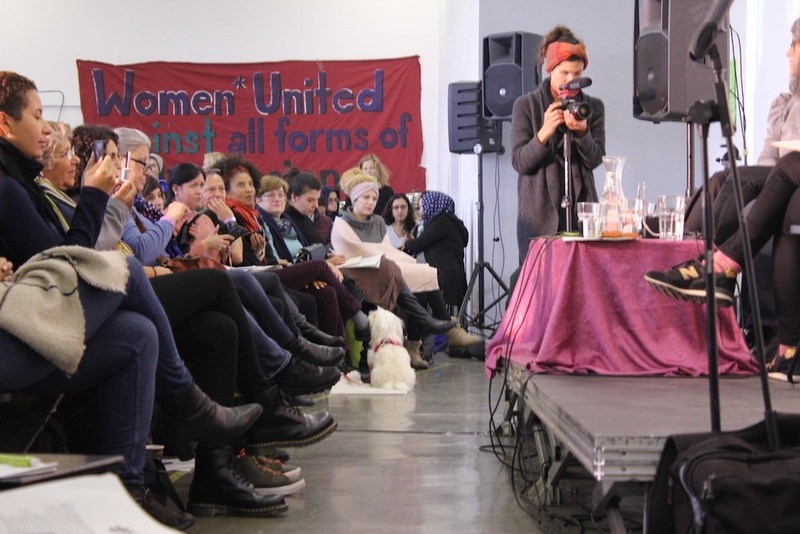 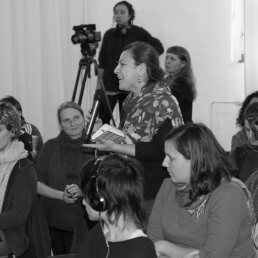 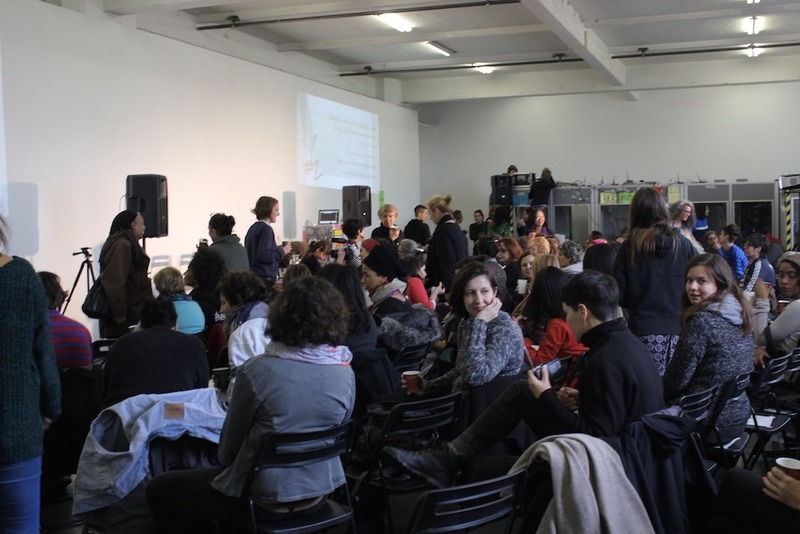 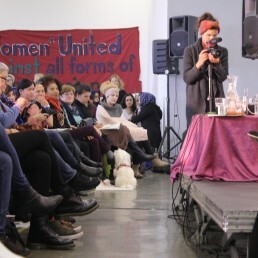 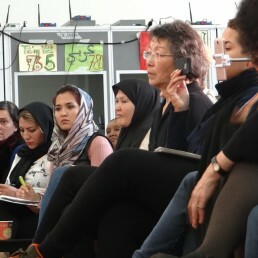 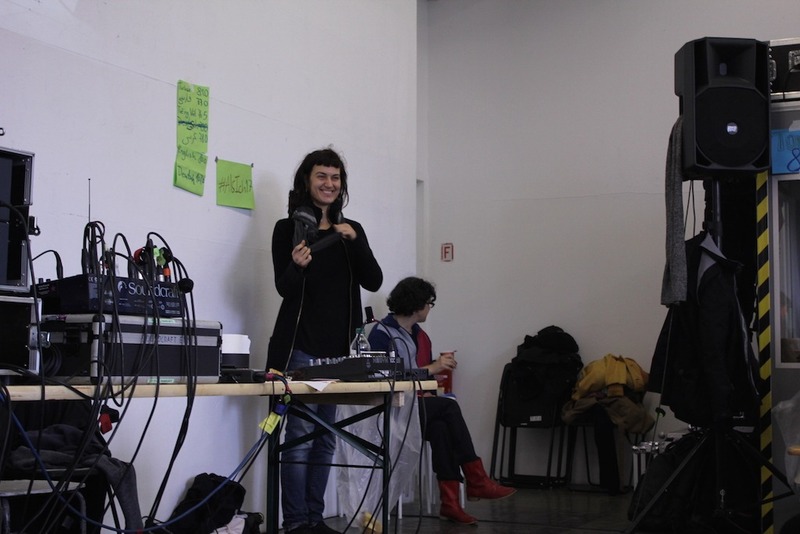 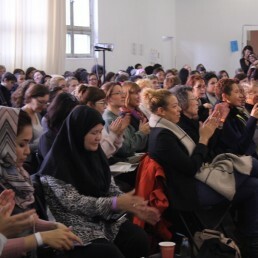 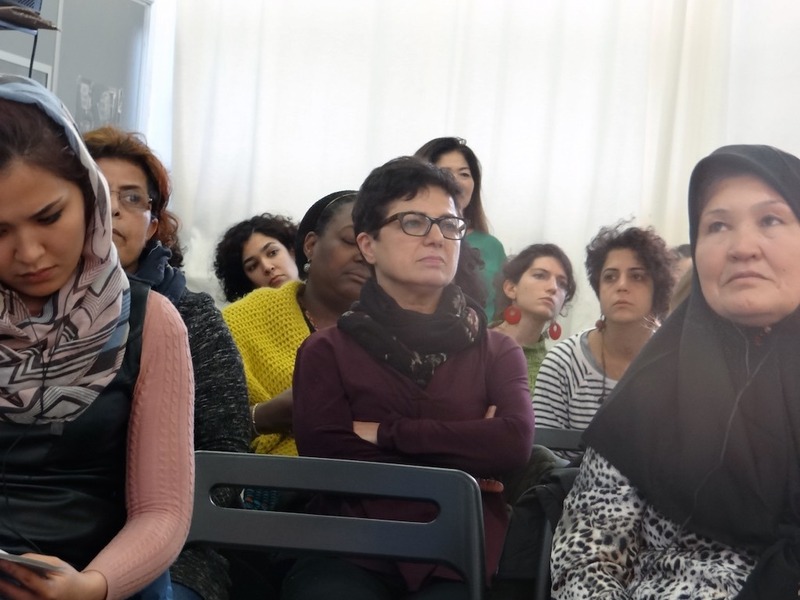 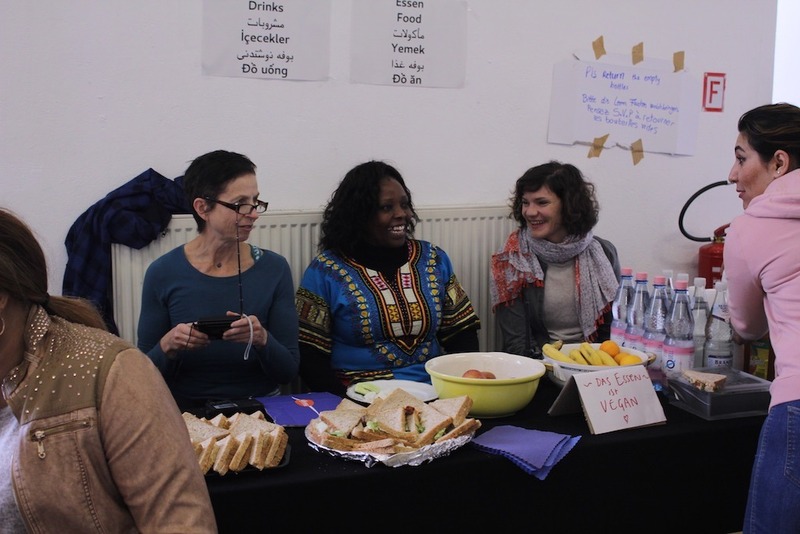 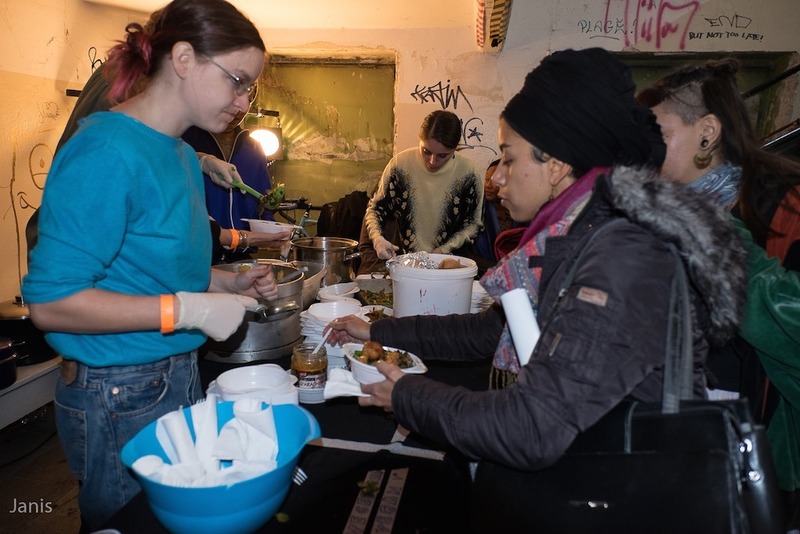 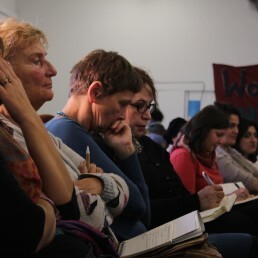 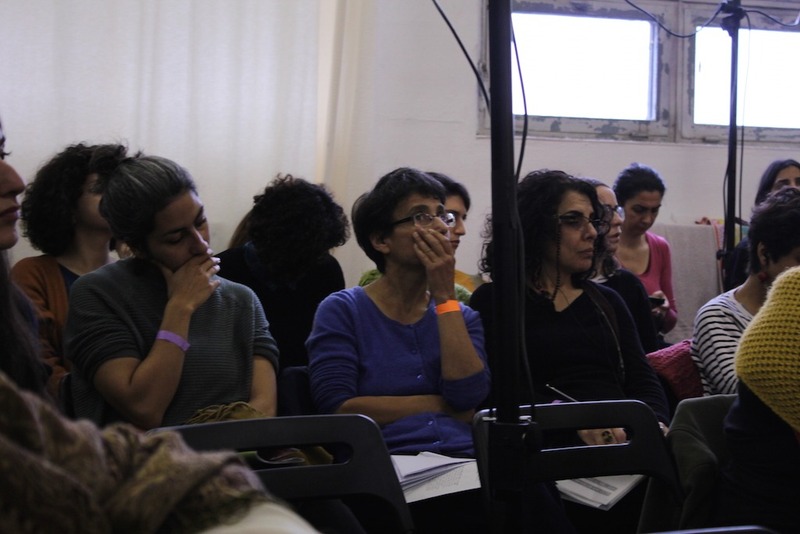 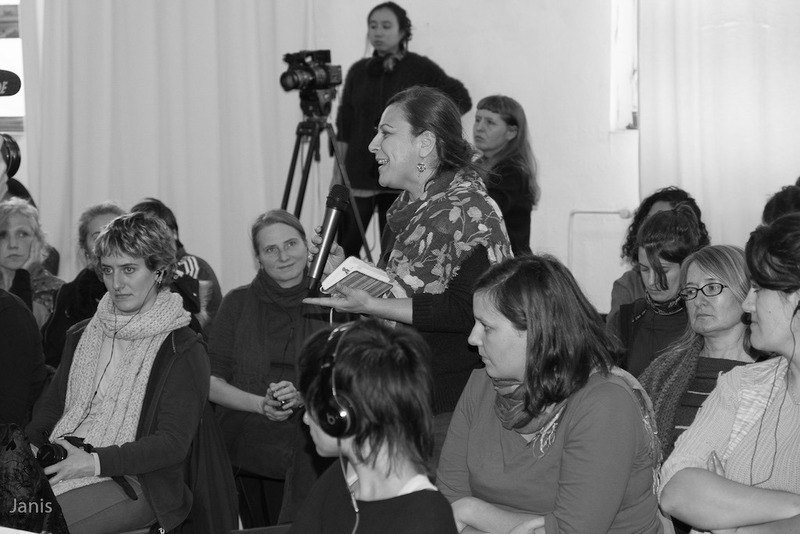 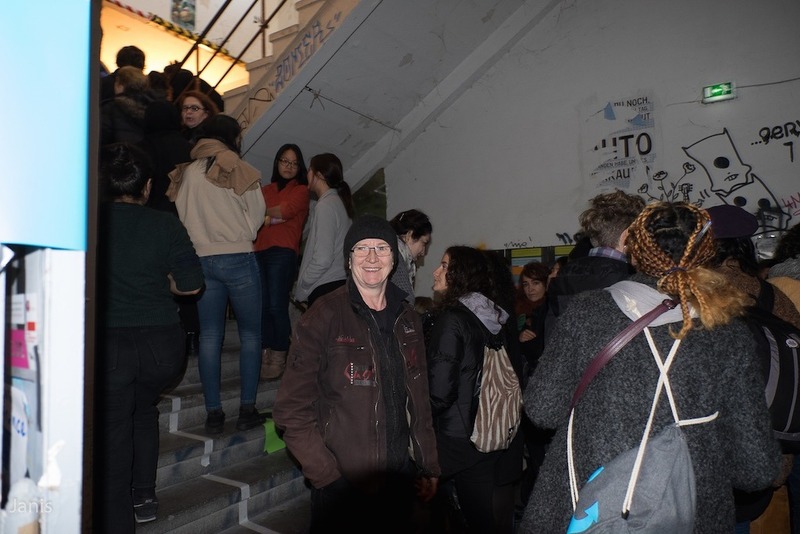 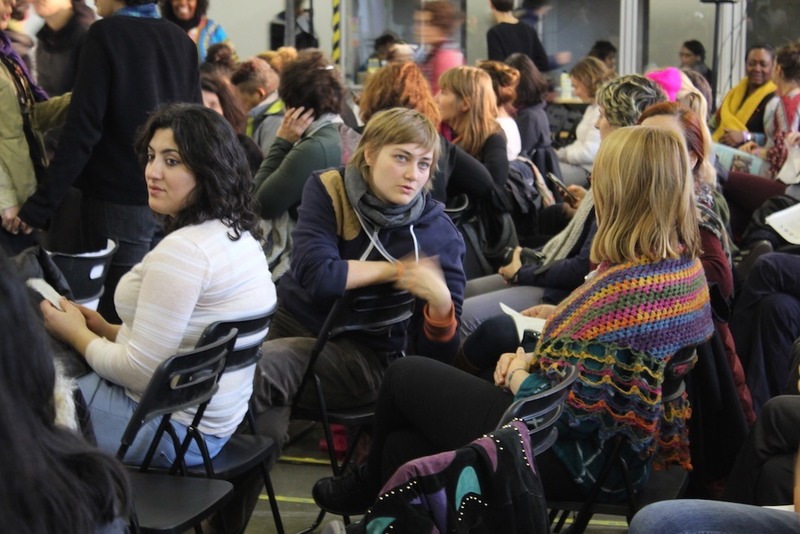 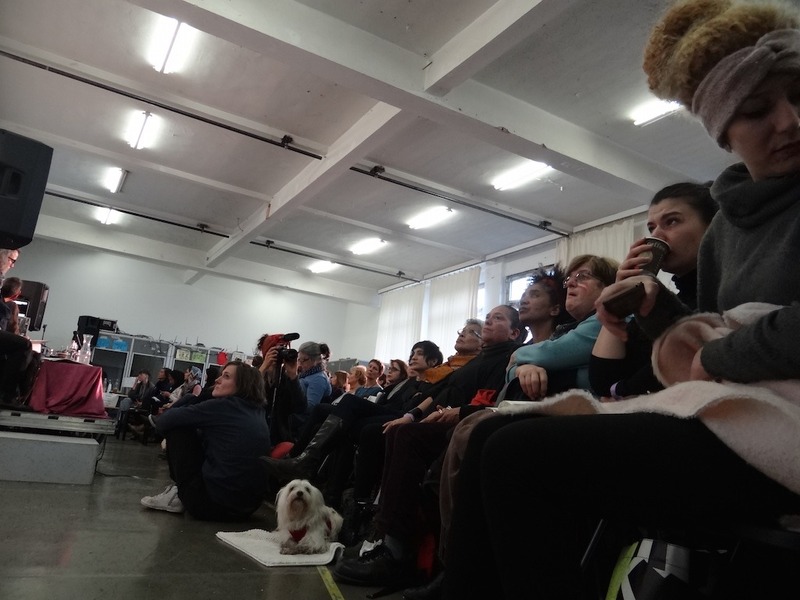 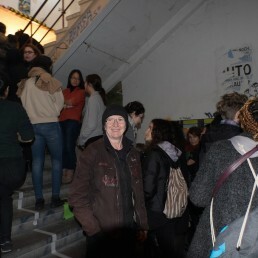 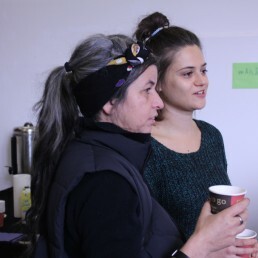 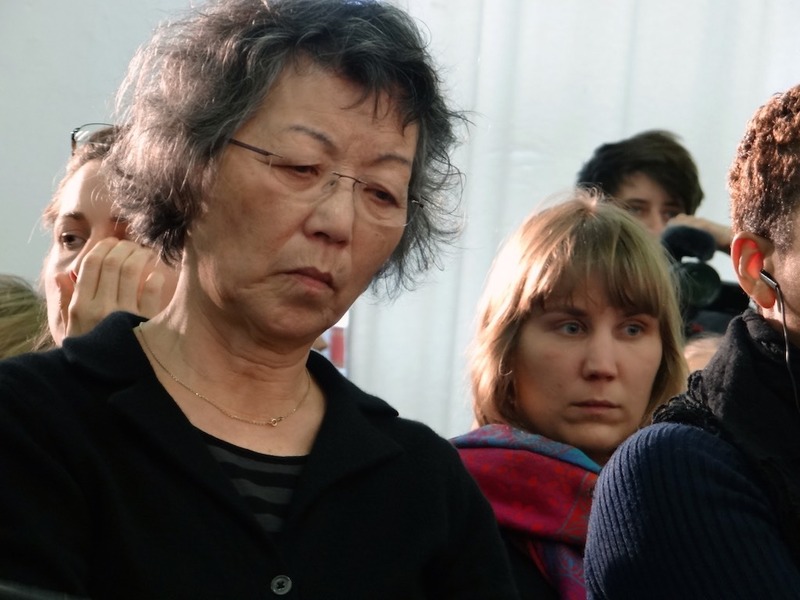 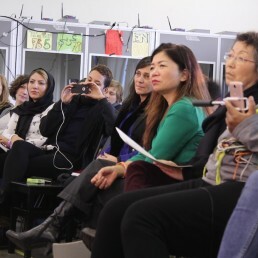 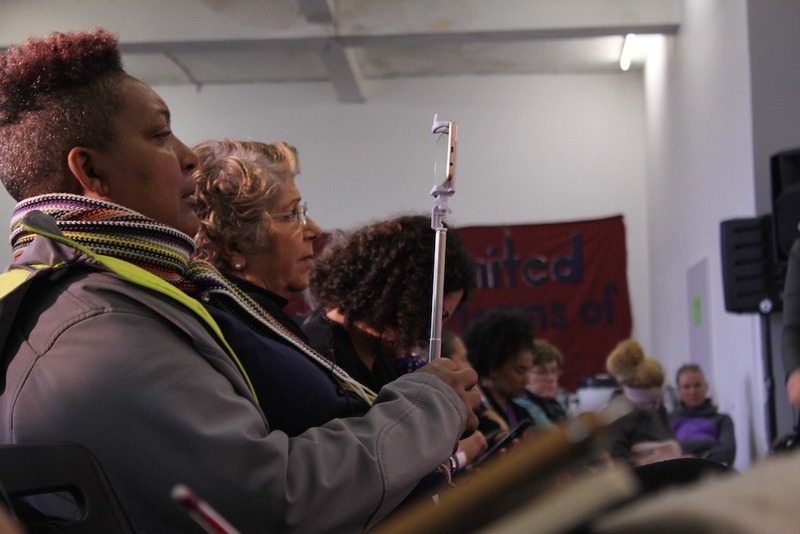 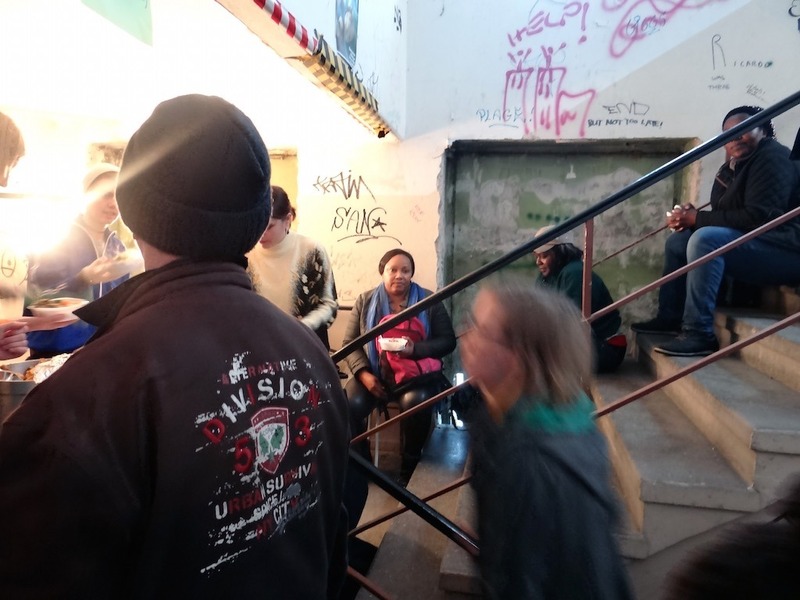 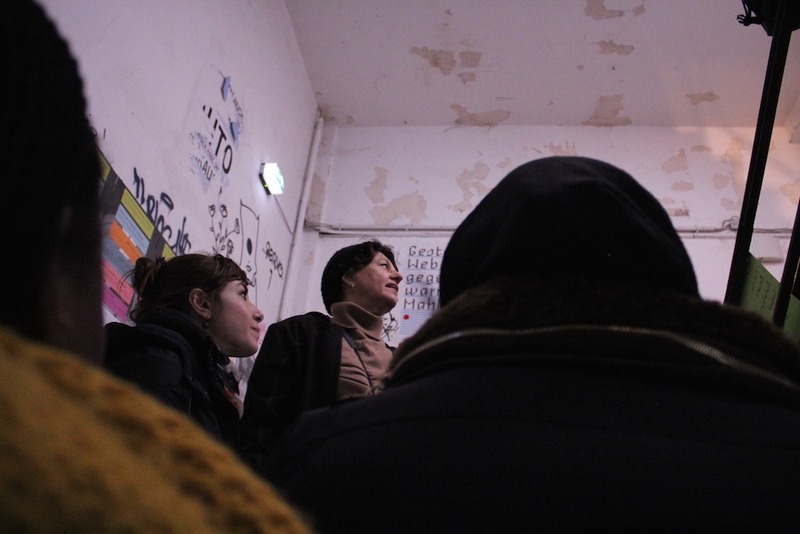 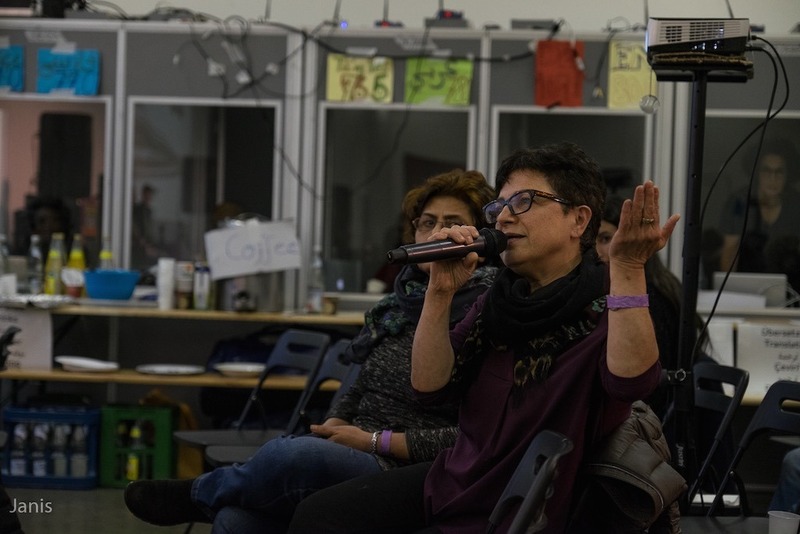 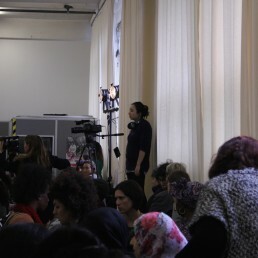 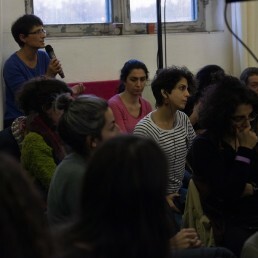 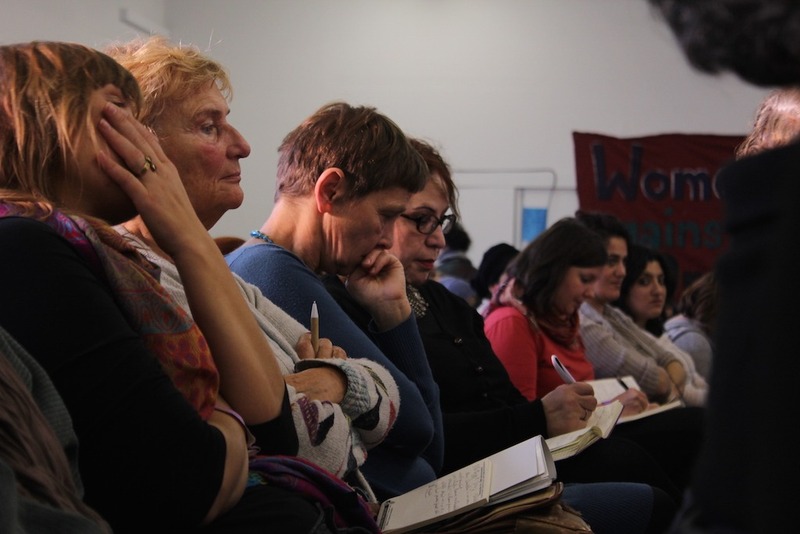 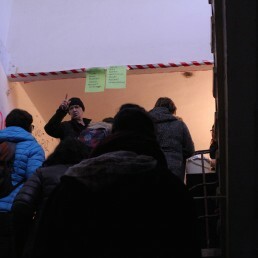 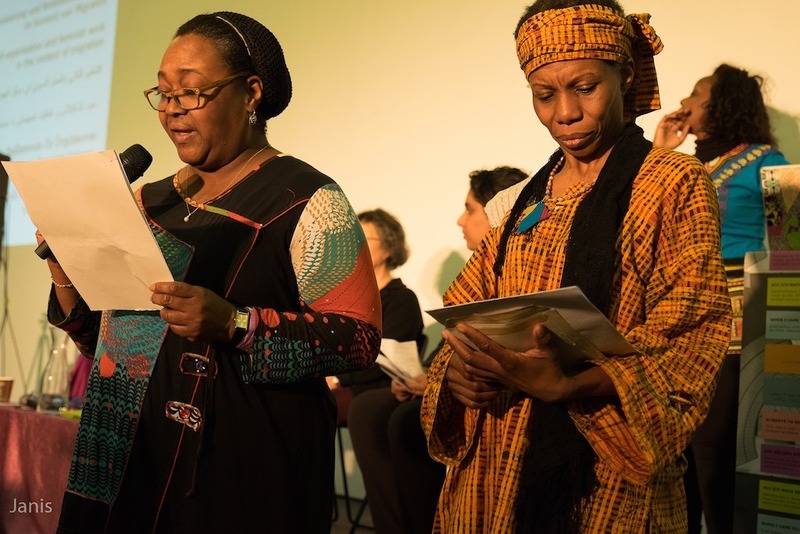 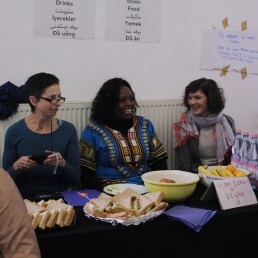 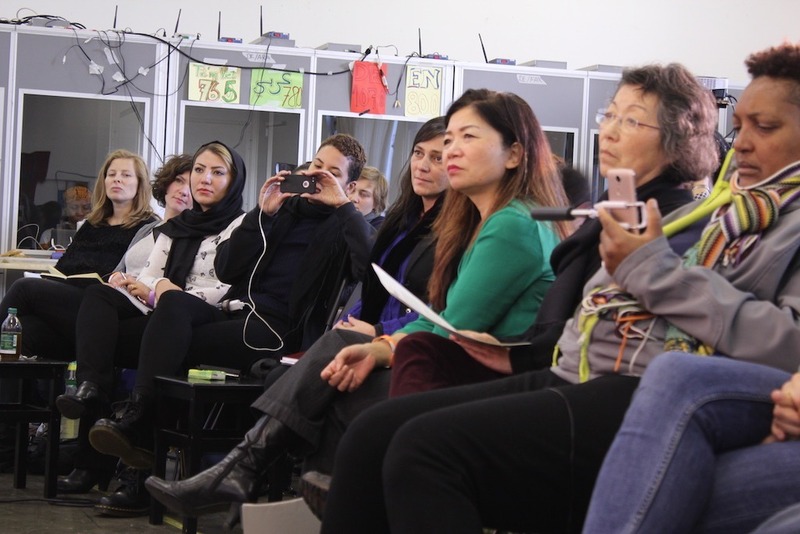 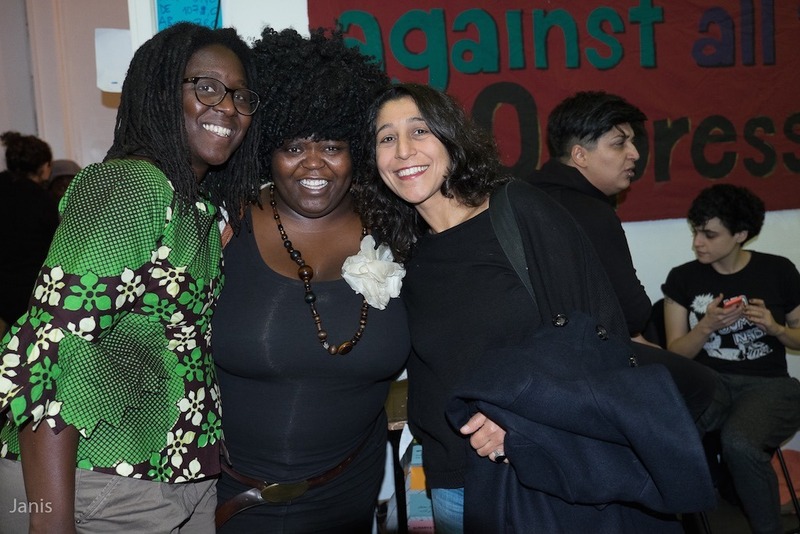 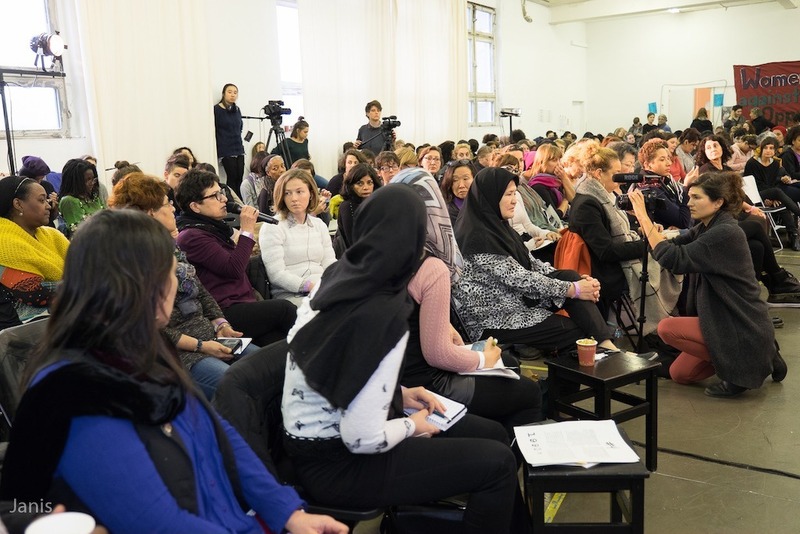 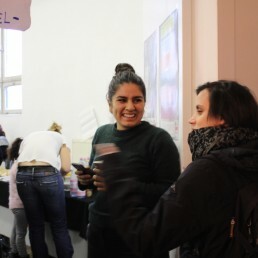 On each day, over 250 women came together, exchanged experiences about political fights and resistance in Germany, learned from the histories of different generations from both East, West and reunited Germany, got to know each other, and built networks. 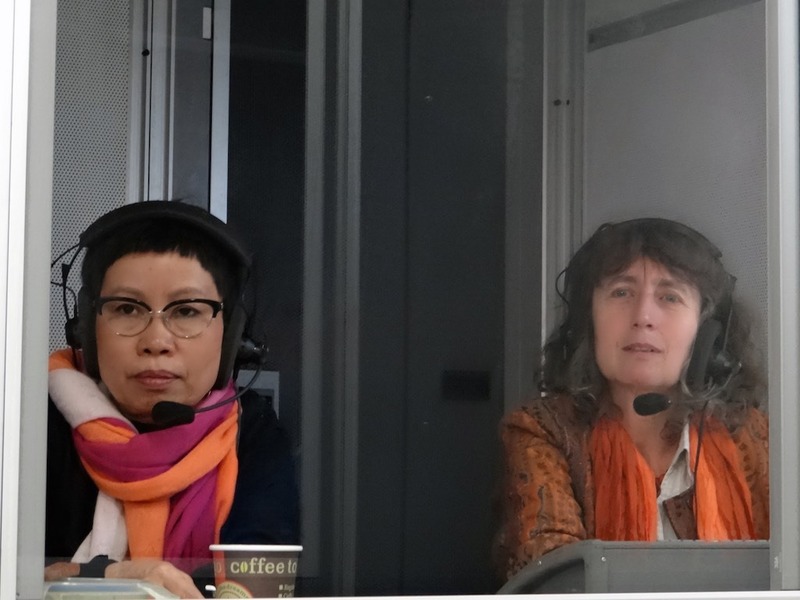 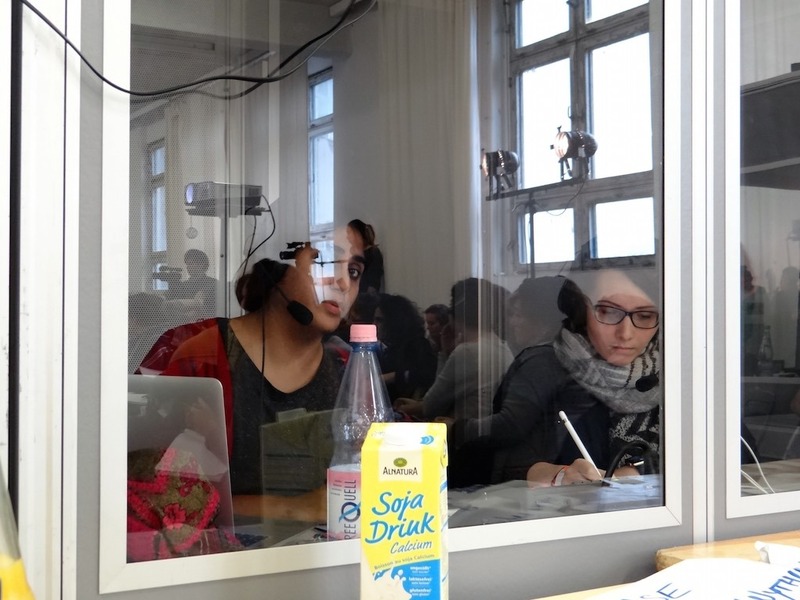 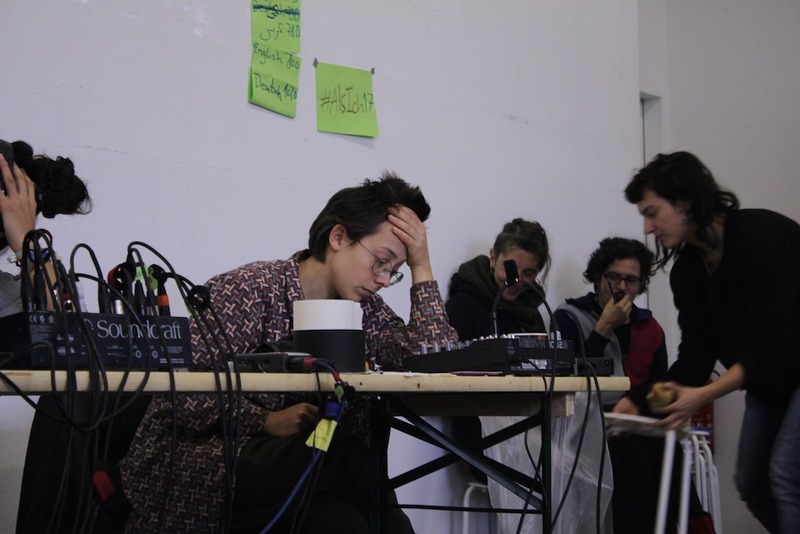 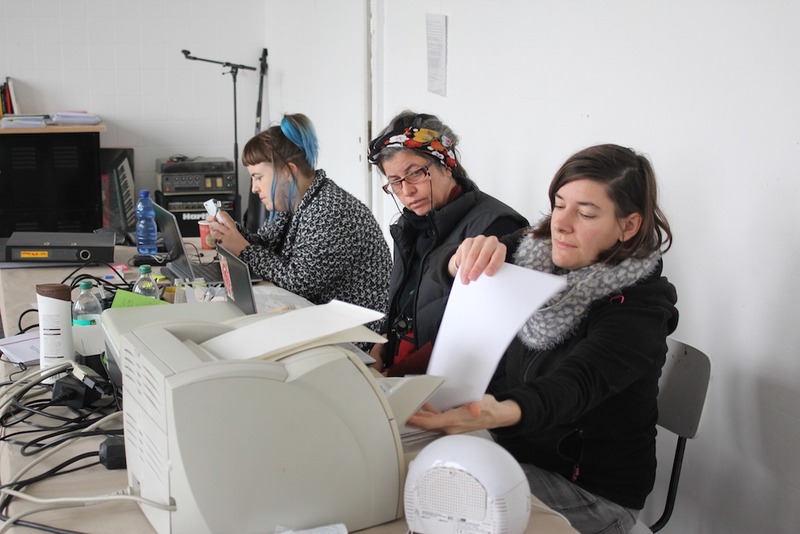 This was made possible, despite language barriers, thanks to running translation in six languages: German, English, Arabic, Farsi, Turkish & Vietnamese. 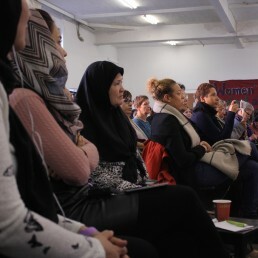 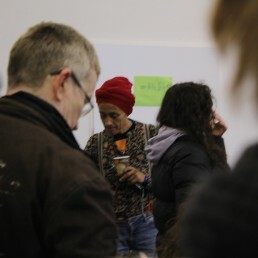 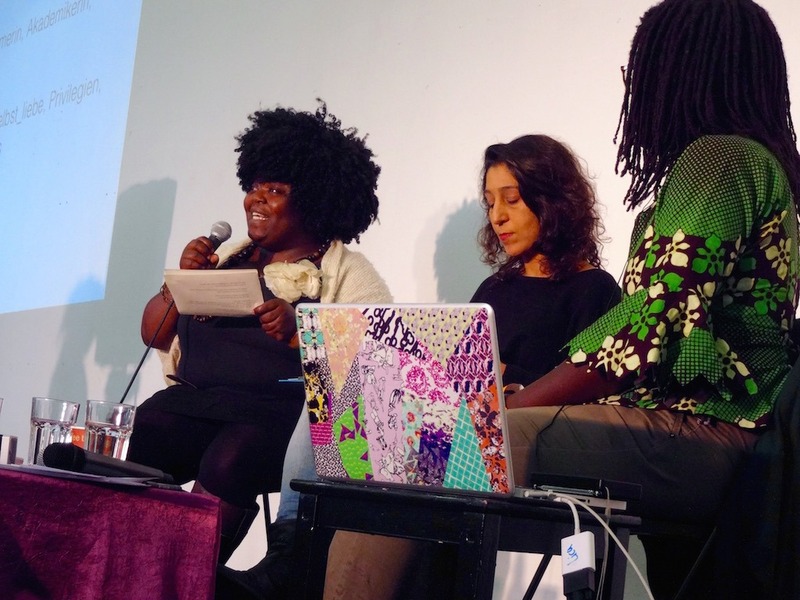 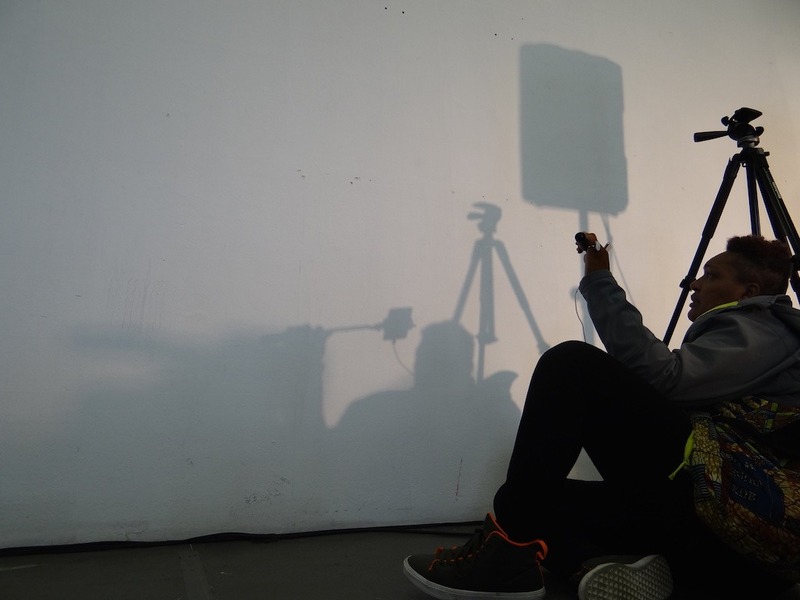 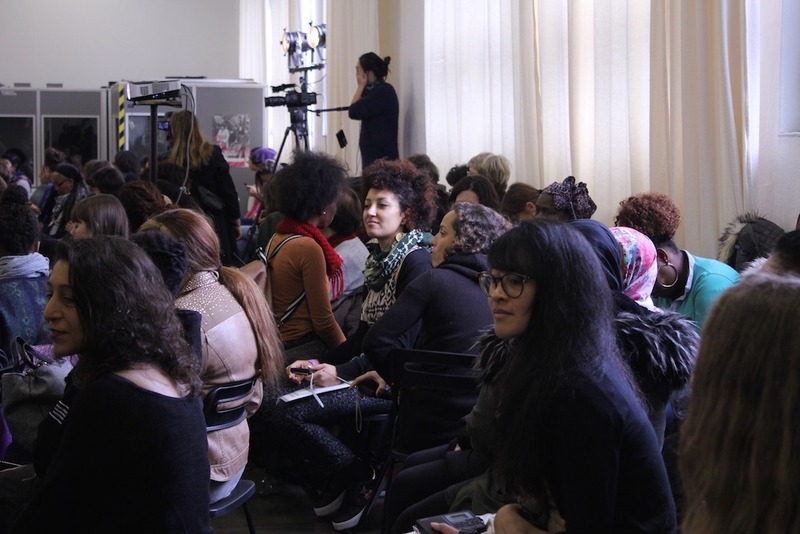 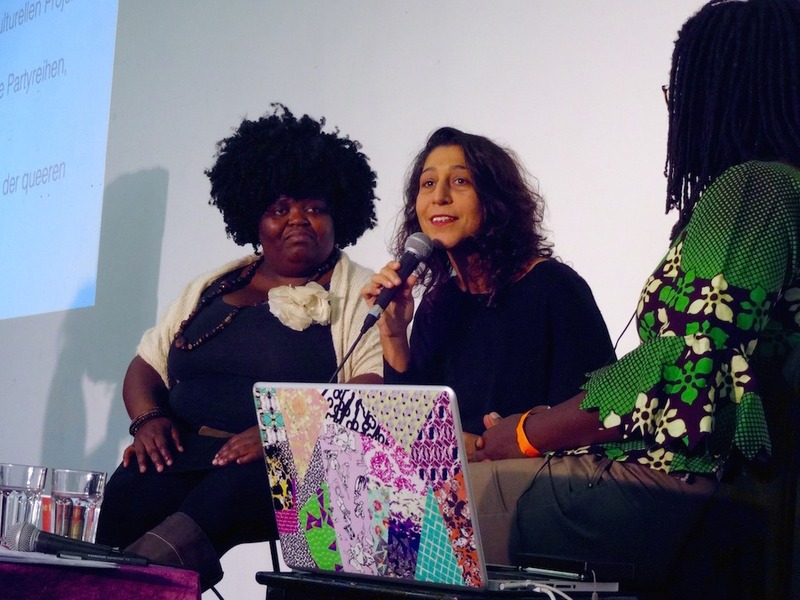 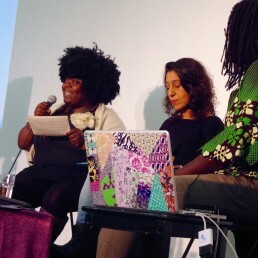 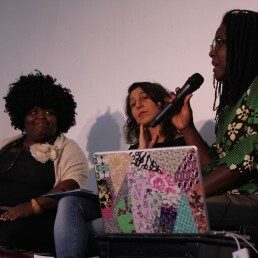 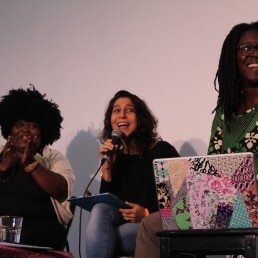 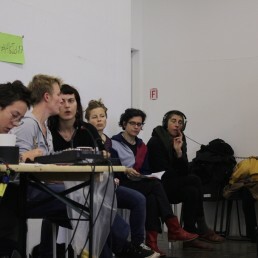 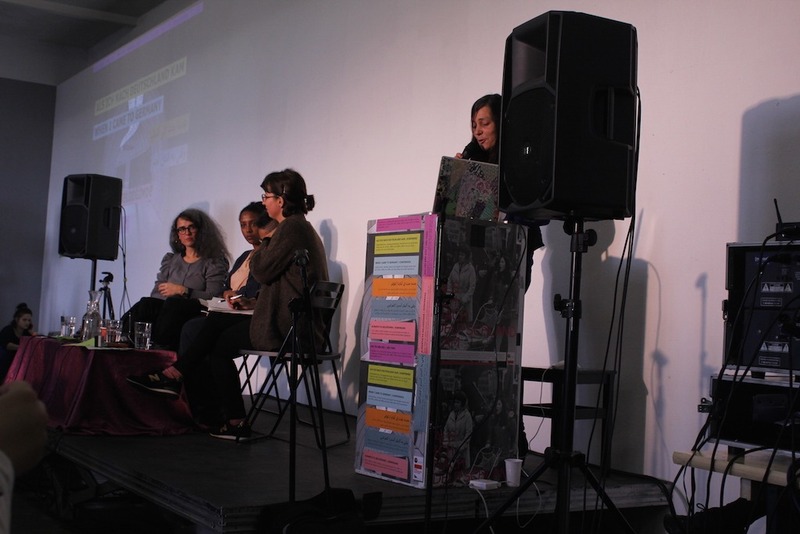 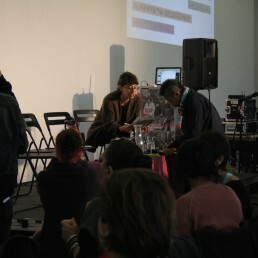 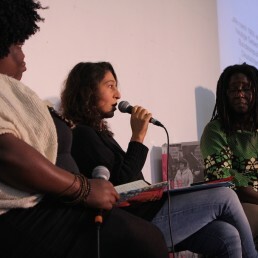 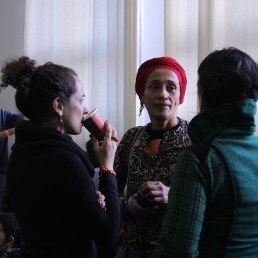 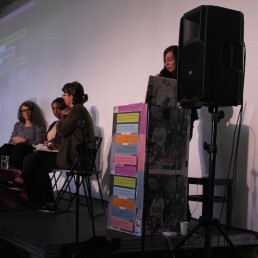 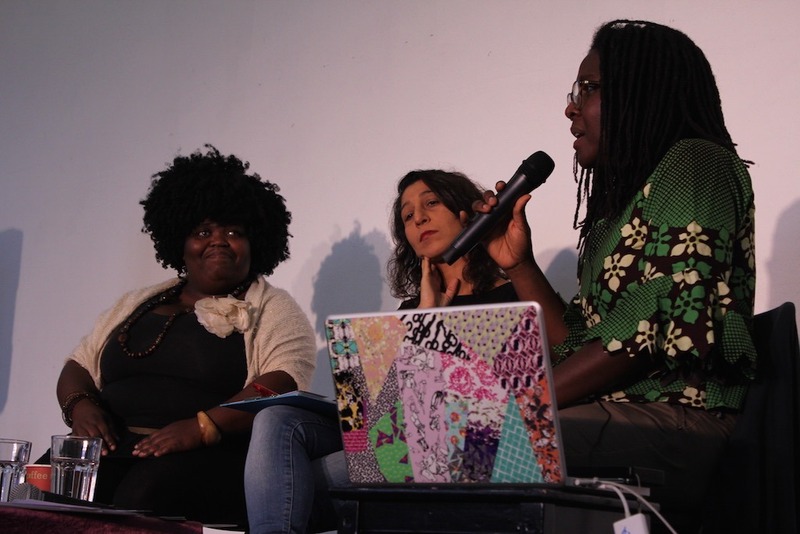 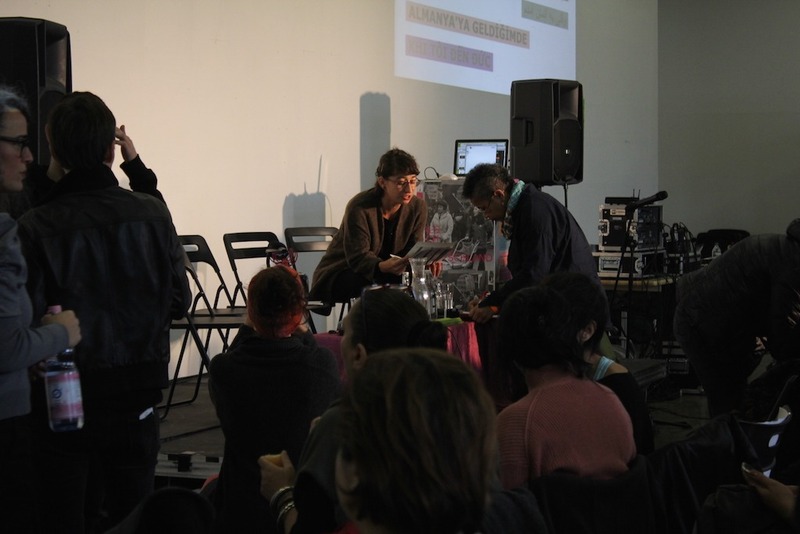 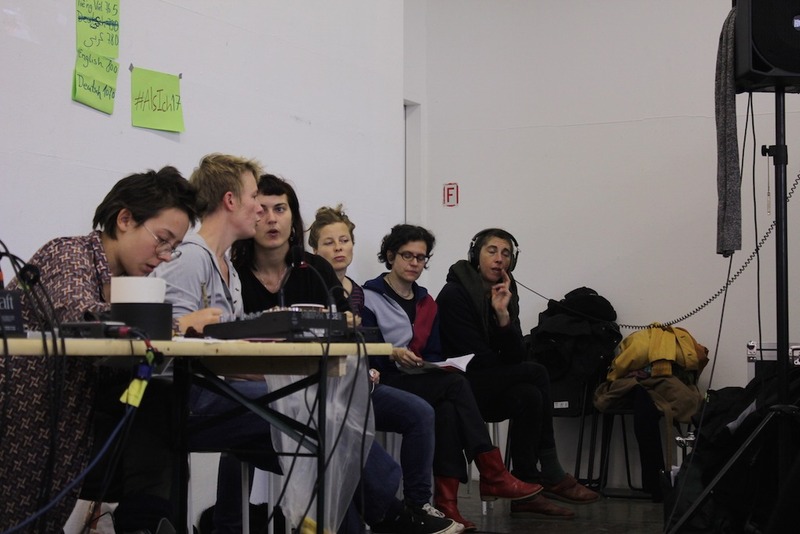 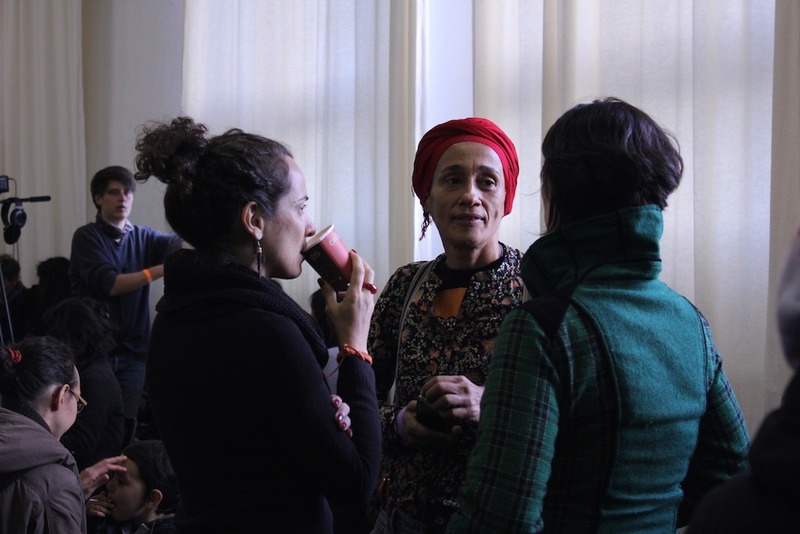 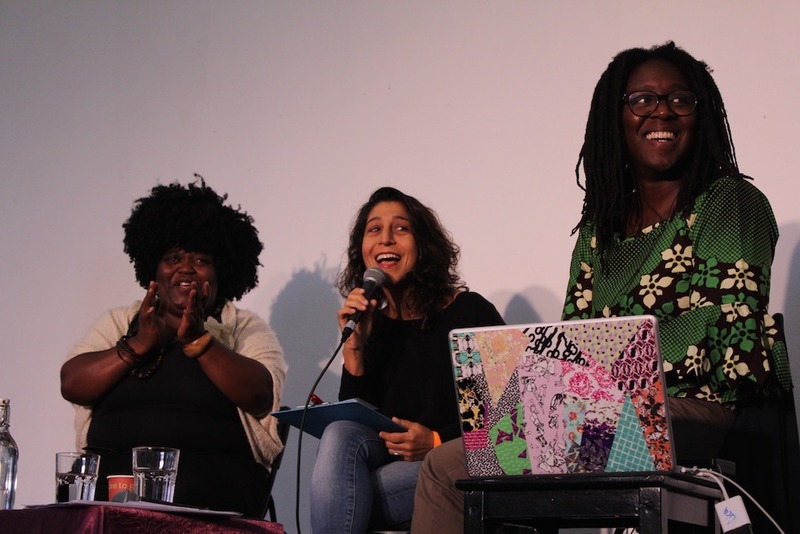 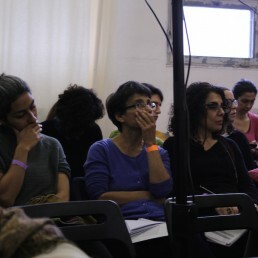 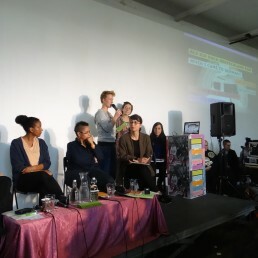 There was an atmosphere of openness and solidarity, so both speakers and participants were able to talk freely about their personal experiences.